Holds information on recordings and videos. ProgramInfo can also contain partial information for a program we wish to find in the schedule, and may also contain information on a video we wish to view. This class is serializable from frontend to backend and back and is the basic unit of information on anything we may wish to view or record. Any method that begins with "Is", "Get" or "Set" will run quickly and the results from "Is" or "Get" do not need to be cached. Any method beginning with "Make" or "Extract" will run quickly, but it may be prudent to cache the results if they are to be used frequently. Any method that begins with "Query", "Save" or "Update" will touch the database and so may take some time to complete. Any method beginning with another verb needs to be examined to determine its expected run time. There is one exception to this set of rules, GetPlaybackURL() is a very complex beast which not only touches the database but also may query remote backends about the files visible to them. It blocks until this task is complete and may need to wake up remote hosts that are currently powered off to complete it's task. It should not be called from the UI thread and its result should be cached. Definition at line 66 of file programinfo.h. Definition at line 70 of file programinfo.h. Definition at line 491 of file programinfo.h. Constructs a manual record ProgramInfo. Constructs a ProgramInfo for a video. Constructs a ProgramInfo from listings data in 'program' table. Constructs a ProgramInfo from data in 'oldrecorded' table. Constructs a ProgramInfo from data in 'recorded' table. Definition at line 74 of file programinfo.h. Referenced by LoadFromOldRecorded(), LoadFromProgram(), LoadFromRecorded(), and LoadProgramFromProgram(). Definition at line 154 of file programinfo.cpp. Definition at line 238 of file programinfo.cpp. Definition at line 269 of file programinfo.cpp. Definition at line 280 of file programinfo.cpp. Definition at line 418 of file programinfo.cpp. Definition at line 493 of file programinfo.cpp. Definition at line 639 of file programinfo.cpp. Constructs a ProgramInfo for a pathname. Definition at line 707 of file programinfo.cpp. Definition at line 743 of file programinfo.cpp. Definition at line 787 of file programinfo.cpp. Definition at line 275 of file programinfo.h. Definition at line 279 of file programinfo.h. Definition at line 285 of file programinfo.h. Compare two ProgramInfo instances to see if they are equal. Equal is defined as all parameters that are serialized and passed across the myth protocol are the same. rhs The ProgramInfo instance to compare to the current instance. True if all the serialized fields match, False otherwise. Definition at line 1042 of file programinfo.cpp. Copies important fields from other ProgramInfo. Definition at line 831 of file programinfo.cpp. Reimplemented in RecordingInfo, and ProgramRecPriorityInfo. Definition at line 838 of file programinfo.cpp. Referenced by RecordingInfo::clone(), PlaybackSock::FillProgramInfo(), operator=(), and Reload(). Ensure that the sortTitle and sortSubtitle fields are set. Definition at line 1139 of file programinfo.cpp. Referenced by FromStringList(), ProgramInfo(), SetSubtitle(), and SetTitle(). Definition at line 932 of file programinfo.cpp. Referenced by RecordingInfo::clear(), PBHEventHandler::event(), LoadProgramFromRecorded(), and ProgramInfo(). Serializes ProgramInfo into a QStringList which can be passed over a socket. Definition at line 1278 of file programinfo.cpp. Referenced by PlaybackBoxHelper::CheckAvailability(), PlaybackSock::CheckFile(), PlaybackSock::CheckRecordingActive(), MainServer::customEvent(), PlaybackSock::DeleteRecording(), PlaybackSock::EncoderIsRecording(), PlaybackSock::FillProgramInfo(), PlaybackSock::GenPreviewPixmap(), Scheduler::GetAllPending(), Scheduler::GetAllScheduled(), Scheduler::getConflicting(), PlaybackBoxHelper::GetPreviewImage(), PreviewGeneratorQueue::GetPreviewImage(), MainServer::HandleQueryRecording(), MainServer::HandleQueryRecordings(), MainServer::HandleRecorderQuery(), MainServer::HandleRemoteEncoder(), TVRec::NotifySchedulerOfRecording(), PlaybackSock::PixmapLastModified(), PlaybackBox::PlayX(), MainServer::reconnectTimeout(), PlaybackSock::RecordPending(), RemoteCheckFile(), RemoteCheckForRecording(), RemoteFillProgramInfo(), RemoteGetConflictList(), RemoteGetExistingRecorder(), RemoteGetPreviewIfModified(), RemoteGetPreviewLastModified(), PreviewGenerator::RemotePreviewRun(), RemoteRecordPending(), RemoteStopRecording(), PlaybackSock::StartRecording(), TVRec::StartRecording(), TV::StartTV(), PlaybackBoxHelper::StopRecording(), and PlaybackSock::StopRecording(). Converts ProgramInfo into QString QHash containing each field in ProgramInfo converted into localized strings. Definition at line 1478 of file programinfo.cpp. Referenced by ProgLister::ClearCurrentProgramInfo(), ViewScheduled::FillList(), PlayerContext::GetPlayingInfoMap(), ProgLister::HandleSelected(), ProgLister::HandleVisible(), PlaybackBox::ItemLoaded(), ScheduleEditor::Load(), TV::QuickRecord(), TVBrowseHelper::run(), SchedEditChild::SetTextFromMaps(), ProgramRecPriorityInfo::ToMap(), ViewScheduleDiff::updateInfo(), ViewScheduled::updateInfo(), GuideGrid::updateInfo(), DeleteMap::UpdateOSD(), IdleScreen::UpdateScreen(), WelcomeDialog::updateScreen(), ViewScheduleDiff::updateUIList(), and PlaybackBox::UpdateUIListItem(). Subsitute MATCH% type variable names in the given string. This method sometimes initiates a QUERY_CHECKFILE MythProto call and so should not be called from the UI thread. Definition at line 5193 of file programinfo.cpp. Referenced by JobQueue::GetJobCommand(), and RecordingInfo::SubstituteMatches(). Checks whether this is the same program as "other", which may or may not be a repeat or on another channel. other ProgramInfo to compare this one with. Definition at line 2162 of file programinfo.cpp. Referenced by PlayerContext::IsSameProgram(), and IsSameProgramAndStartTime(). Checks for duplicates according to dupmethod. Definition at line 2093 of file programinfo.cpp. true if this program is the same and shares same start time as "other" program. Definition at line 2220 of file programinfo.cpp. Checks title, chanid or callsign and start times for equality. true if this program shares same time slot as "other" program. Definition at line 2236 of file programinfo.cpp. Referenced by Scheduler::AddNewRecords(), Scheduler::ChangeRecordingEnd(), Scheduler::MarkShowingsList(), Scheduler::PruneOverlaps(), Scheduler::PruneRedundants(), and Scheduler::TryAnotherShowing(). Checks title, chanid or chansign, start/end times, cardid, inputid for fully inclusive overlap. true if this program is contained in time slot of "other" program. Definition at line 2250 of file programinfo.cpp. Referenced by Scheduler::AddRecording(), and Scheduler::UpdateRecStatus(). Definition at line 316 of file programinfo.h. Definition at line 2272 of file programinfo.cpp. Referenced by handle_command(), and Scheduler::Scheduler(). Checks for duplicate using only title, chanid and startts. Definition at line 2082 of file programinfo.cpp. Definition at line 324 of file programinfo.h. Referenced by Scheduler::GetRecStatus(), and EncoderLink::MatchesRecording(). Checks whether channel id or callsign are identical. Definition at line 2265 of file programinfo.cpp. Referenced by IsSameProgramAndStartTime(), IsSameTitleStartTimeAndChannel(), IsSameTitleTimeslotAndChannel(), and ProgramInfo(). Creates a unique string that can be used to identify an existing recording. Definition at line 331 of file programinfo.h. Referenced by TV::AskAllowRecording(), commDetectorGotNewCommercialBreakList(), TV::customEvent(), DoFlagCommercials(), LiveTVChain::DoGetNextProgram(), MythPlayer::EventLoop(), TVRec::FinishedRecording(), PlaybackBoxHelper::GetPreviewImage(), RecorderBase::GetRecordingQuality(), MainServer::HandleGenPreviewPixmap(), TV::HandleStateChange(), Scheduler::HandleWakeSlave(), TVRec::InitAutoRunJobs(), LoadFromRecorded(), RecordingInfo::MakeUniqueSchedulerKey(), QueryInUseMap(), QueryJobsRunning(), RecordingQuality::RecordingQuality(), PreviewGenerator::RemotePreviewRun(), TVRec::StartedRecording(), and TVRec::SwitchLiveTVRingBuffer(). Returns length of program/recording in seconds. Definition at line 1803 of file programinfo.cpp. Returns channel info using "format". There are three tags in "format" that will be replaced with the appropriate info. These tags are "<num>", "<sign>", and "<name>", they replaced with the channel number, channel call sign, and channel name, respectively. Definition at line 4674 of file programinfo.cpp. Referenced by ProgramInfo(), and ToMap(). Definition at line 335 of file programinfo.h. Referenced by ClearBookmarks(), ClearSeekTable(), AutoExpire::ExpireRecordings(), FillProgramInfo(), Scheduler::FillRecordingDir(), PreviewGeneratorQueue::GeneratePreviewImage(), get_filename(), GetPlaybackURL(), PlayerContext::GetPlayingInfoMap(), PreviewGeneratorQueue::GetPreviewImage(), TVRec::GetProgramRingBufferForLiveTV(), TV::GetStatus(), MainServer::HandleQueryRecordings(), Scheduler::HandleRecording(), ImportRecorder::Open(), print_comm_flag_output(), TV::QuickRecord(), ImportRecorder::run(), PreviewGenerator::Run(), RunCCExtract(), PreviewGenerator::RunReal(), TVRec::StartedRecording(), TVRec::SwitchRecordingRingBuffer(), RecordingSelector::titleChanged(), and TVRec::TuningNewRecorder(). Definition at line 336 of file programinfo.h. Referenced by clone(), doUpgradeTVDatabaseSchema(), LiveTVChain::EntryToProgram(), PreviewGeneratorQueue::GeneratePreviewImage(), PlayerContext::GetPlayingInfoMap(), PreviewGeneratorQueue::GetPreviewImage(), MainServer::HandleQueryRecordings(), ProgDetails::loadPage(), LoadProgramFromRecorded(), LookupFromProgramInfo(), MarkAsInUse(), QueryBasename(), TV::QuickRecord(), PreviewGenerator::SaveOutFile(), RecordingInfo::StartedRecording(), and SubstituteMatches(). Definition at line 337 of file programinfo.h. Referenced by PlayerContext::GetPlayingInfoMap(), TV::QuickRecord(), and SaveWatched(). Definition at line 339 of file programinfo.h. Referenced by GetPlaybackURL(), PlayerContext::GetPlayingInfoMap(), internal_play_media(), TV::QuickRecord(), and PlayerContext::SetInitialTVState(). Definition at line 341 of file programinfo.h. Definition at line 343 of file programinfo.h. Referenced by EncoderLink::CheckFile(), DiscoverRecordingDirectory(), JobQueue::DoFlagCommercialsThread(), AutoExpire::ExpireRecordings(), TVRec::FinishedRecording(), Content::GetPreviewImage(), MainServer::HandleGenPreviewPixmap(), and IsFileReadable(). Definition at line 348 of file programinfo.h. Definition at line 349 of file programinfo.h. Definition at line 350 of file programinfo.h. Referenced by Dvr::DeleteRecording(), PlaybackSock::GetRecording(), MainServer::HandleGenPreviewPixmap(), Dvr::ReactivateRecording(), TV::StartTV(), Dvr::UnDeleteRecording(), and Dvr::UpdateRecordedWatchedStatus(). Attempts to ascertain if the main file for this ProgramInfo is readable. This method often initiates a QUERY_CHECKFILE MythProto call and so should not be called from the UI thread. Definition at line 4749 of file programinfo.cpp. Definition at line 353 of file programinfo.h. Referenced by RecordingInfo::AddHistory(), Scheduler::AddNewRecords(), Scheduler::AddRecording(), TV::AskAllowRecording(), Scheduler::AssignGroupInput(), RecordingRule::AssignProgramInfo(), ScheduledRecording::BuildCheckRequest(), Scheduler::BuildListMaps(), comp_overlap(), comp_priority(), comp_redundant(), comp_retry(), LookerUpper::CopyRuleInetrefsToRecordings(), RecMetadataEdit::Create(), CreateProgramInfoString(), PlaybackBox::CreateProgramInfoString(), CustomEdit::CustomEdit(), StatusBox::customEvent(), LookerUpper::customEvent(), ProgFinder::customEvent(), ProgramRecPriority::deactivate(), PrevRecordedList::DeleteOldSeries(), ProgLister::DeleteOldSeries(), StatusBox::doAutoExpireList(), MainServer::DoHandleDeleteRecording(), StatusBox::doJobQueueStatus(), StatusBox::doTunerStatus(), CustomEdit::evaluate(), MythBDPlayer::EventStart(), MythDVDPlayer::EventStart(), AutoExpire::ExpireRecordings(), extract_subtitle(), TV::FillOSDMenuJumpRec(), FillProgramInfo(), HttpStatus::FillProgramInfo(), GuideUpdateProgramRow::fillProgramRowInfosWith(), Scheduler::FindNextConflict(), TVRec::FinishedRecording(), FlagCommercials(), GuideGrid::gestureEvent(), PlayGroup::GetInitialName(), Dvr::GetRecordedList(), RecordingSelector::getRecordingList(), TV::GetStatus(), LookerUpper::HandleAllArtwork(), LookerUpper::HandleAllRecordingRules(), LookerUpper::HandleAllRecordings(), Scheduler::HandleRecording(), ProgLister::HandleVisible(), Scheduler::HandleWakeSlave(), PlaybackBox::ItemLoaded(), GuideGrid::keyPressEvent(), CustomEdit::loadClauses(), CustomPriority::loadData(), ProgDetails::loadPage(), MetadataFactory::Lookup(), LookupFromProgramInfo(), Scheduler::MarkOtherShowings(), RecordingSelector::OKPressed(), TV::Playback(), print_comm_flag_output(), Scheduler::PutInactiveSlavesToSleep(), TV::QuickRecord(), RebuildSeekTable(), CustomEdit::recordClicked(), RemoteGetExistingRecorder(), RemoteGetRecordingStatus(), PlaybackBox::saveRecMetadata(), Scheduler::SchedNewFirstPass(), PlayerContext::SetPseudoLiveTV(), PrevRecordedList::ShowDeleteOldEpisodeMenu(), ProgLister::ShowDeleteOldEpisodeMenu(), PrevRecordedList::ShowDeleteOldSeriesMenu(), ProgLister::ShowDeleteOldSeriesMenu(), TV::ShowLCDChannelInfo(), TV::ShowOSDPromptDeleteRecording(), ScheduleCommon::ShowPrevious(), PlaybackBox::ShowRecordedEpisodes(), ScheduleCommon::ShowUpcoming(), ScheduleCommon::ShowUpcomingScheduled(), Scheduler::SlaveConnected(), Scheduler::SlaveDisconnected(), TVRec::StartRecording(), RecordingSelector::titleChanged(), Scheduler::TryAnotherShowing(), TVRec::TuningRestartRecorder(), TVRec::TuningSignalCheck(), RecordingSelector::updateRecordingList(), PlaybackBox::UpdateUIListItem(), and PlaybackBox::UpdateUILists(). Definition at line 354 of file programinfo.h. Referenced by RecordingRule::AssignProgramInfo(), comp_sorttitle_lt(), comp_sorttitle_lt_rev(), TitleSort::operator()(), ProgramCountSort::operator()(), ProgramRecCountSort::operator()(), ProgramLastRecordSort::operator()(), ProgramAvgDelaySort::operator()(), and PlaybackBox::UpdateUILists(). Definition at line 355 of file programinfo.h. Referenced by RecordingRule::AssignProgramInfo(), ScheduledRecording::BuildCheckRequest(), comp_priority(), comp_retry(), LookerUpper::CopyRuleInetrefsToRecordings(), RecMetadataEdit::Create(), CreateProgramInfoString(), PlaybackBox::CreateProgramInfoString(), LookerUpper::customEvent(), StatusBox::doTunerStatus(), ScheduleCommon::EditRecording(), CustomEdit::evaluate(), extract_subtitle(), TV::FillOSDMenuJumpRec(), FillProgramInfo(), HttpStatus::FillProgramInfo(), FlagCommercials(), TV::GetStatus(), GuessLookupType(), LookerUpper::HandleAllArtwork(), LookerUpper::HandleAllRecordingRules(), LookerUpper::HandleAllRecordings(), ProgLister::HandleVisible(), CustomEdit::loadClauses(), ProgDetails::loadPage(), MetadataFactory::Lookup(), LookupFromProgramInfo(), RecordingSelector::OKPressed(), TV::Playback(), RebuildSeekTable(), RemoteGetRecordingStatus(), Scheduler::SchedNewFirstPass(), TV::ShowLCDChannelInfo(), TV::ShowOSDPromptDeleteRecording(), RecordingSelector::titleChanged(), TVRec::TuningSignalCheck(), ProgramRecPriority::UpdateList(), and RecordingSelector::updateRecordingList(). Definition at line 356 of file programinfo.h. Referenced by RecordingRule::AssignProgramInfo(), TitleSort::operator()(), ProgramCountSort::operator()(), ProgramRecCountSort::operator()(), ProgramLastRecordSort::operator()(), and ProgramAvgDelaySort::operator()(). Definition at line 357 of file programinfo.h. Referenced by RecordingRule::AssignProgramInfo(), ScheduledRecording::BuildCheckRequest(), comp_priority(), comp_retry(), RecMetadataEdit::Create(), ScheduleCommon::EditRecording(), CustomEdit::evaluate(), FillProgramInfo(), HttpStatus::FillProgramInfo(), ProgDetails::loadPage(), LookupFromProgramInfo(), RecordingSelector::OKPressed(), Scheduler::SchedNewFirstPass(), ProgLister::ShowOldRecordedMenu(), RecordingSelector::titleChanged(), and RecordingSelector::updateRecordingList(). Definition at line 358 of file programinfo.h. Referenced by RecordingRule::AssignProgramInfo(), comp_season(), comp_season_rev(), MetadataOptions::Create(), RecMetadataEdit::Create(), CustomEdit::evaluate(), FillProgramInfo(), PlayerContext::GetPlayingInfoMap(), Content::GetRecordingArtworkList(), GuessLookupType(), LookerUpper::HandleAllArtwork(), LookerUpper::HandleAllRecordings(), ProgDetails::loadPage(), MetadataFactory::Lookup(), LookupFromProgramInfo(), ToMap(), PlaybackBox::updateGroupInfo(), RecordingSelector::updateRecordingList(), and PlaybackBox::UpdateUIListItem(). Definition at line 359 of file programinfo.h. Referenced by RecordingRule::AssignProgramInfo(), comp_season(), comp_season_rev(), MetadataOptions::Create(), RecMetadataEdit::Create(), CustomEdit::evaluate(), FillProgramInfo(), GuessLookupType(), LookerUpper::HandleAllRecordings(), ProgDetails::loadPage(), MetadataFactory::Lookup(), LookupFromProgramInfo(), ToMap(), and RecordingSelector::updateRecordingList(). Definition at line 360 of file programinfo.h. Referenced by FillProgramInfo(), and ProgDetails::loadPage(). Definition at line 361 of file programinfo.h. Referenced by RecordingRule::AssignProgramInfo(), CustomEdit::evaluate(), FillProgramInfo(), HttpStatus::FillProgramInfo(), GuideUpdateProgramRow::fillProgramRowInfosWith(), PlayGroup::GetInitialName(), Dvr::GetRecordedList(), TVRec::GetRecordEndTime(), RecordingRule::LoadByProgram(), CustomEdit::loadClauses(), ProgDetails::loadPage(), LookupFromProgramInfo(), ProgramRecPriority::newTemplate(), ProgramRecPriority::remove(), and PlaybackBox::UpdateUILists(). This is the unique key used in the database to locate tuning information. [1..2^32] are valid keys, 0 is not. Definition at line 364 of file programinfo.h. Referenced by Content::AddRecordingLiveStream(), LiveTVChain::AppendNewProgram(), TV::AskAllowRecording(), Scheduler::AssignGroupInput(), RecordingRule::AssignProgramInfo(), TVBrowseHelper::BrowseStart(), TV::ChangeChannel(), CheckRecordings(), ClearBookmarks(), ClearSeekTable(), ClearSkipList(), RecordingInfo::clone(), comp_overlap(), comp_priority(), comp_recstart(), comp_retry(), CompleteJob(), CopySkipListToCutList(), PlaybackBox::createJobMenu(), PlaybackBox::createPlaylistJobMenu(), PlaybackBox::customEvent(), MainServer::customEvent(), TV::customEvent(), commDetector2::debugDirectory(), PrevRecordedList::DeleteOldEpisode(), ProgLister::DeleteOldEpisode(), LiveTVChain::DeleteProgram(), Dvr::DeleteRecording(), MainServer::DoDeleteThread(), TV::DoEditSchedule(), DoFlagCommercials(), MainServer::DoHandleDeleteRecording(), PlaybackBox::doJobQueueJob(), StatusBox::doJobQueueStatus(), PlaybackBox::doPlaylistJobQueueJob(), TV::DoQueueTranscode(), StatusBox::doTunerStatus(), LiveTVChain::EntryToProgram(), CustomEdit::evaluate(), MythPlayer::EventLoop(), PlaybackBox::extract_commflag_state(), PlaybackBox::extract_job_state(), FillCastMemberList(), HttpStatus::FillChannelInfo(), FillCommBreak(), FillCutList(), AutoExpire::FillDBOrdered(), FillProgramInfo(), Scheduler::FillRecordingDir(), FillSeek(), HttpStatus::FillStatusXML(), Scheduler::FindNextConflict(), LiveTVChain::FinishedRecording(), TVRec::FinishedRecording(), FlagCommercials(), GetMarkupList(), GetPlaybackURL(), PlayerContext::GetPlayingInfoMap(), Content::GetPreviewImage(), GetProgramInfo(), getProgramInfoForFile(), RemoteEncoder::GetRecording(), Content::GetRecording(), PlaybackSock::GetRecording(), JobQueue::GetRunningJobID(), TV::GetStatus(), MainServer::HandleAnnounce(), TV::HandlePseudoLiveTVTimerEvent(), MainServer::HandleQueryRecording(), Scheduler::HandleRecording(), Scheduler::HandleRecordingStatusChange(), MainServer::HandleStopRecording(), MainServer::HandleUndeleteRecording(), incomingCustomEvent(), init_jobs(), RecordingInfo::InsertProgram(), TVRec::IsBusy(), Scheduler::IsBusyRecording(), JobQueue::IsJobRunning(), EncoderLink::IsRecording(), TV::ITVRestart(), ProgDetails::loadPage(), FileServerHandler::LocalFilePath(), MainServer::LocalFilePath(), LookupFromProgramInfo(), main(), Dvr::ManageJobQueue(), MythPlayer::OpenFile(), TV::PlaybackMenuInit(), Frontend::PlayRecording(), ProgDetails::PowerPriorities(), preview_helper(), print_comm_flag_output(), JobQueue::ProcessJob(), PlaybackBox::processNetworkControlCommand(), TV::ProcessNetworkControlCommand(), LiveTVChain::ProgramIsAt(), QueueCommFlagJob(), QueueJob(), JobQueue::QueueRecordingJobs(), QueueTranscodeJob(), TV::QuickRecord(), Dvr::ReactivateRecording(), Reload(), ReloadBookmark(), RemoteDeleteRecording(), RemoteUndeleteRecording(), PreviewGenerator::Run(), TVBrowseHelper::run(), SendMythSystemPlayEvent(), SendMythSystemRecEvent(), SetCutList(), TVRec::SetLiveRecording(), LiveTVChain::SetProgram(), RecorderBase::SetRecordingStatus(), ScheduleCommon::ShowChannelSearch(), ScheduleCommon::ShowGuide(), ProgFinder::ShowGuide(), ScheduleCommon::ShowUpcoming(), EncoderLink::StartRecording(), TVRec::StartRecording(), TV::StartTV(), PlaybackBox::stopPlaylistJobQueueJob(), Dvr::StopRecording(), MythSystemEventHandler::SubstituteMatches(), TVRec::SwitchRecordingRingBuffer(), toString(), Scheduler::TryAnotherShowing(), TVRec::TuningNewRecorder(), TVRec::TuningRestartRecorder(), TVRec::TuningSignalCheck(), Dvr::UnDeleteRecording(), Dvr::UpdateRecordedWatchedStatus(), Scheduler::UpdateRecStatus(), and WaitToDelete(). This is the channel "number", in the form 1, 1_2, 1-2, 1#1, etc. i.e. this is what the user enters to tune to the channel. This is purely for use in the user interface. Definition at line 368 of file programinfo.h. Referenced by TVBrowseHelper::BrowseStart(), comp_recstart(), comp_redundant(), TV::DoEditSchedule(), StatusBox::doJobQueueStatus(), CustomEdit::evaluate(), HttpStatus::FillChannelInfo(), TV::HandlePseudoLiveTVTimerEvent(), LookupFromProgramInfo(), MythPlayer::OpenFile(), Scheduler::PrintRec(), PlayerContext::SetPseudoLiveTV(), ScheduleCommon::ShowGuide(), ProgFinder::ShowGuide(), and RecordingInfo::SubstituteMatches(). 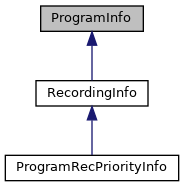 This is the unique programming identifier of a channel. For example "BBC1 Crystal Palace". The channel may be broadcast over satelite, cable and terrestrially – but will almost always contain the same programming. This is used when determining if two channels can be treated as the same channel in recording rules. In the DB this is called 'callsign' for historic reasons. Definition at line 375 of file programinfo.h. Referenced by Scheduler::AssignGroupInput(), RecordingRule::AssignProgramInfo(), comp_recstart(), comp_redundant(), CustomEdit::evaluate(), HttpStatus::FillChannelInfo(), CustomEdit::loadClauses(), ViewScheduled::LoadList(), LookupFromProgramInfo(), MythPlayer::OpenFile(), TV::Playback(), Scheduler::PrintRec(), TV::ShowLCDChannelInfo(), Scheduler::SlaveConnected(), and Scheduler::SlaveDisconnected(). This is the channel name in the local market, i.e. BBC1. This is purely for use in the user interface. Definition at line 378 of file programinfo.h. Referenced by Scheduler::AddNewRecords(), StatusBox::doJobQueueStatus(), CustomEdit::evaluate(), HttpStatus::FillChannelInfo(), LookupFromProgramInfo(), and RemoteGetRecordingStatus(). Definition at line 379 of file programinfo.h. Referenced by HttpStatus::FillChannelInfo(), PlayerContext::GetFilters(), and LookupFromProgramInfo(). The scheduled start time of program. Definition at line 382 of file programinfo.h. Referenced by RecordingInfo::AddHistory(), Scheduler::AddNewRecords(), RecordingRule::AssignProgramInfo(), TVBrowseHelper::BrowseStart(), ClearBookmarks(), ClearSeekTable(), RecordingInfo::clone(), comp_originalAirDate(), comp_originalAirDate_rev(), comp_overlap(), comp_recordDate(), comp_recordDate_rev(), comp_redundant(), PrevRecordedList::DeleteOldEpisode(), ProgLister::DeleteOldEpisode(), DoFlagCommercials(), CustomEdit::evaluate(), FillCastMemberList(), FillProgramInfo(), HttpStatus::FillProgramInfo(), GuideUpdateProgramRow::fillProgramRowInfosWith(), TVRec::FinishedRecording(), GuideGrid::gestureEvent(), get_start(), TVBrowseHelper::GetNextProgramDB(), GuideGrid::keyPressEvent(), RecordingRule::LoadBySearch(), ViewScheduled::LoadList(), ProgDetails::loadPage(), PreviewGenerator::LocalPreviewRun(), LookupFromProgramInfo(), RecordingSelector::OKPressed(), TV::PlaybackMenuInit(), ProgDetails::PowerPriorities(), TV::ProcessNetworkControlCommand(), RecordingInfo::RecordingInfo(), RemoteGetRecordingStatus(), TVRec::SetLiveRecording(), RecorderBase::SetRecording(), RecorderBase::SetRecordingStatus(), ScheduleCommon::ShowChannelSearch(), ScheduleCommon::ShowGuide(), ProgFinder::ShowGuide(), Scheduler::SlaveConnected(), RecordingSelector::titleChanged(), toString(), Scheduler::TryAnotherShowing(), TVRec::TuningNewRecorder(), TVRec::TuningSignalCheck(), RecordingSelector::updateRecordingList(), and Scheduler::UpdateRecStatus(). The scheduled start time of program (with formatting). Definition at line 384 of file programinfo.h. The scheduled end time of the program. Definition at line 389 of file programinfo.h. Referenced by RecordingRule::AssignProgramInfo(), comp_overlap(), comp_redundant(), DoFlagCommercials(), CustomEdit::evaluate(), FillProgramInfo(), HttpStatus::FillProgramInfo(), GuideUpdateProgramRow::fillProgramRowInfosWith(), get_end(), TVRec::GetProgramRingBufferForLiveTV(), ViewScheduled::LoadList(), ProgDetails::loadPage(), PreviewGenerator::LocalPreviewRun(), LookupFromProgramInfo(), Scheduler::PrintList(), Scheduler::PruneRedundants(), RecordingInfo::RecordingInfo(), RemoteGetRecordingStatus(), TVRec::run(), MythPlayer::SetWatched(), and RecordingSelector::updateRecordingList(). The scheduled end time of the program (with formatting). Definition at line 391 of file programinfo.h. Approximate time the recording started. Definition at line 396 of file programinfo.h. Referenced by LiveTVChain::AppendNewProgram(), RecordingInfo::ApplyNeverRecord(), Scheduler::AssignGroupInput(), CheckRecordings(), RecordingInfo::clone(), comp_originalAirDate(), comp_originalAirDate_rev(), comp_priority(), comp_programid(), comp_programid_rev(), comp_recordDate(), comp_recordDate_rev(), comp_recpriority2(), comp_recstart(), comp_retry(), comp_sortdate_lt(), comp_sortdate_lt_rev(), CompleteJob(), PlaybackBox::createJobMenu(), PlaybackBox::createPlaylistJobMenu(), CreateProgramInfoString(), PlaybackBox::CreateProgramInfoString(), ScheduleCommon::customEvent(), TV::customEvent(), LiveTVChain::DeleteProgram(), Dvr::DeleteRecording(), StatusBox::doAutoExpireList(), DoFlagCommercials(), MainServer::DoHandleDeleteRecording(), PlaybackBox::doJobQueueJob(), StatusBox::doJobQueueStatus(), PlaybackBox::doPlaylistJobQueueJob(), TV::DoQueueTranscode(), ScheduleCommon::EditRecording(), PlaybackBox::extract_commflag_state(), PlaybackBox::extract_job_state(), ViewScheduled::FillList(), FillProgramInfo(), HttpStatus::FillProgramInfo(), Scheduler::FillRecordingDir(), Scheduler::FindNextConflict(), LiveTVChain::FinishedRecording(), TVRec::FinishedRecording(), PreviewGeneratorQueue::GeneratePreviewImage(), GetPlaybackURL(), TVRec::GetProgramRingBufferForLiveTV(), JobQueue::GetRunningJobID(), TV::GetStatus(), Scheduler::HandleRecording(), Scheduler::HandleRecordingStatusChange(), Scheduler::HandleReschedule(), Scheduler::HandleWakeSlave(), incomingCustomEvent(), init_jobs(), JobQueue::IsJobRunning(), EncoderLink::IsRecording(), ViewScheduled::LoadList(), ProgDetails::loadPage(), PreviewGenerator::LocalPreviewRun(), LookupFromProgramInfo(), Dvr::ManageJobQueue(), Scheduler::MarkShowingsList(), Frontend::PlayRecording(), print_comm_flag_output(), AutoExpire::PrintExpireList(), Scheduler::PrintList(), Scheduler::PrintRec(), TV::ProcessNetworkControlCommand(), LiveTVChain::ProgramIsAt(), Scheduler::PutInactiveSlavesToSleep(), QueueCommFlagJob(), QueueJob(), JobQueue::QueueRecordingJobs(), QueueTranscodeJob(), ReloadBookmark(), RemoteDeleteRecording(), RemoteUndeleteRecording(), PreviewGenerator::Run(), Scheduler::SchedNewFirstPass(), Scheduler::SchedNewRetryPass(), SendMythSystemPlayEvent(), SendMythSystemRecEvent(), LiveTVChain::SetProgram(), PlayerContext::SetPseudoLiveTV(), MythPlayer::SetWatched(), ViewScheduleDiff::showStatus(), Scheduler::ShutdownServer(), EncoderLink::StartRecording(), TVRec::StartRecording(), PlaybackBox::stopPlaylistJobQueueJob(), Dvr::StopRecording(), ToMap(), toString(), Scheduler::TryAnotherShowing(), TVRec::TuningRestartRecorder(), Dvr::UnDeleteRecording(), Scheduler::UpdateNextRecord(), WaitToDelete(), and EncoderLink::WouldConflict(). Approximate time the recording started (with formatting). Definition at line 398 of file programinfo.h. Approximate time the recording should have ended, did end, or is intended to end. Definition at line 404 of file programinfo.h. Referenced by Scheduler::AddNewRecords(), LiveTVChain::AppendNewProgram(), Scheduler::AssignGroupInput(), Scheduler::ChangeRecordingEnd(), comp_recstart(), CreateProgramInfoString(), PlaybackBox::CreateProgramInfoString(), MainServer::customEvent(), StatusBox::doAutoExpireList(), DoFlagCommercials(), MainServer::DoHandleDeleteRecording(), ScheduleCommon::EditRecording(), FillProgramInfo(), HttpStatus::FillProgramInfo(), Scheduler::FillRecordingDir(), Scheduler::FindNextConflict(), LiveTVChain::FinishedRecording(), TVRec::FinishedRecording(), FlagCommercials(), PreviewGeneratorQueue::GeneratePreviewImage(), TVRec::GetProgramRingBufferForLiveTV(), TVRec::GetRecordEndTime(), TVRec::HandlePendingRecordings(), MainServer::HandleQueryRecordings(), Scheduler::HandleRecording(), Scheduler::HandleReschedule(), ViewScheduled::LoadList(), LookupFromProgramInfo(), Scheduler::PrintList(), Scheduler::PrintRec(), Scheduler::PruneRedundants(), RunCCExtract(), Scheduler::SchedLiveTV(), PlayerContext::SetInitialTVState(), TVRec::SetLiveRecording(), PlayerContext::SetPseudoLiveTV(), RecorderBase::SetRecordingStatus(), MythPlayer::SetWatched(), ViewScheduleDiff::showStatus(), EncoderLink::StartRecording(), TVRec::StartRecording(), Transcode::TranscodeFile(), TVRec::TuningFrequency(), TVRec::TuningNewRecorder(), TVRec::TuningRestartRecorder(), and TVRec::TuningSignalCheck(). Approximate time the recording should have ended, did end, or is intended to end (with formatting). Definition at line 407 of file programinfo.h. Definition at line 411 of file programinfo.h. Referenced by CheckRecordings(), MainServer::customEvent(), StatusBox::doAutoExpireList(), MainServer::DoHandleDeleteRecording(), TV::FillOSDMenuJumpRec(), FillProgramInfo(), HttpStatus::FillProgramInfo(), PlaybackBox::FindProgramInUILists(), Dvr::GetRecordedList(), TV::GetRecordingGroup(), RecordingSelector::getRecordingList(), LookerUpper::HandleAllArtwork(), LookerUpper::HandleAllRecordings(), MainServer::HandleIsRecording(), PlaybackBox::HandleUpdateProgramInfoEvent(), ProgDetails::loadPage(), LookupFromProgramInfo(), JobQueue::ProcessJob(), QueryIsDeleteCandidate(), RemoteGetCurrentlyRecordingList(), PlaybackBox::setRecGroup(), PlaybackBox::ShowActionPopup(), PlaybackBox::ShowDeletePopup(), PlaybackBox::ShowRecGroupChanger(), TVRec::StartedRecording(), and PlaybackBox::UpdateUILists(). Definition at line 412 of file programinfo.h. Referenced by FillProgramInfo(), HttpStatus::FillProgramInfo(), TV::HandleStateChange(), ProgDetails::loadPage(), LookupFromProgramInfo(), PlayerContext::SetInitialTVState(), and PlaybackBox::ShowPlayGroupChanger(). Definition at line 413 of file programinfo.h. Referenced by Content::AddRecordingLiveStream(), MainServer::DoHandleDeleteRecording(), MainServer::DoHandleStopRecording(), PlaybackBox::doJobQueueJob(), PlaybackBox::doPlaylistJobQueueJob(), TV::DoQueueTranscode(), doUpgradeTVDatabaseSchema(), AutoExpire::ExpireRecordings(), FillProgramInfo(), HttpStatus::FillProgramInfo(), Scheduler::FillRecordingDir(), Content::GetPreviewImage(), Content::GetRecording(), MainServer::HandleGenPreviewPixmap(), MainServer::HandleQueryRecordings(), Scheduler::HandleRecording(), ProgDetails::loadPage(), LookupFromProgramInfo(), AutoExpire::PrintExpireList(), JobQueue::QueueRecordingJobs(), RecordingInfo::StartedRecording(), transUnlink(), and PlaybackBox::UpdateUIListItem(). Definition at line 414 of file programinfo.h. Referenced by Content::AddRecordingLiveStream(), doUpgradeTVDatabaseSchema(), FillProgramInfo(), Dvr::GetRecordedList(), Scheduler::HandleRecording(), ProgDetails::loadPage(), LookupFromProgramInfo(), RecordingInfo::StartedRecording(), and transUnlink(). Definition at line 415 of file programinfo.h. Referenced by LookerUpper::customEvent(), MetadataOptions::customEvent(), FillProgramInfo(), and LookupFromProgramInfo(). Definition at line 420 of file programinfo.h. Referenced by comp_originalAirDate(), comp_originalAirDate_rev(), FillProgramInfo(), HttpStatus::FillProgramInfo(), ProgDetails::loadPage(), and LookupFromProgramInfo(). Definition at line 421 of file programinfo.h. Referenced by FillProgramInfo(), HttpStatus::FillProgramInfo(), PreviewGeneratorQueue::GeneratePreviewImage(), and LookupFromProgramInfo(). Definition at line 422 of file programinfo.h. Definition at line 6135 of file programinfo.cpp. Referenced by CheckRecordings(), PlaybackBox::customEvent(), StatusBox::doAutoExpireList(), MainServer::DoDeleteThread(), LiveTVChain::DoGetNextProgram(), AutoExpire::ExpireRecordings(), extract_main_state(), FillCastMemberList(), FillProgramInfo(), HttpStatus::FillProgramInfo(), RecordingInfo::GetFilesize(), MainServer::HandleQueryRecordings(), ProgDetails::loadPage(), RecordingSelector::OKPressed(), PlaybackBox::Play(), AutoExpire::PrintExpireList(), RecordingSelector::titleChanged(), UpdateFileSize(), PlaybackBox::updateGroupInfo(), and RecordingSelector::updateRecordingList(). Definition at line 427 of file programinfo.h. Referenced by RecordingRule::AssignProgramInfo(), LookerUpper::customEvent(), CustomEdit::evaluate(), FillProgramInfo(), HttpStatus::FillProgramInfo(), CustomEdit::loadClauses(), ProgDetails::loadPage(), LookupFromProgramInfo(), ScheduleCommon::ShowUpcoming(), and ScheduleCommon::ShowUpcomingScheduled(). Definition at line 428 of file programinfo.h. Referenced by RecordingRule::AssignProgramInfo(), ScheduledRecording::BuildCheckRequest(), comp_priority(), comp_programid(), comp_programid_rev(), comp_retry(), ScheduleCommon::EditRecording(), CustomEdit::evaluate(), FillProgramInfo(), HttpStatus::FillProgramInfo(), TV::GetStatus(), CustomEdit::loadClauses(), ProgDetails::loadPage(), LookupFromProgramInfo(), and Scheduler::SchedNewFirstPass(). Definition at line 429 of file programinfo.h. Referenced by RecordingRule::AssignProgramInfo(), LookerUpper::CopyRuleInetrefsToRecordings(), RecMetadataEdit::Create(), FillProgramInfo(), PlayerContext::GetPlayingInfoMap(), Content::GetRecordingArtworkList(), GuessLookupType(), LookerUpper::HandleAllArtwork(), LookerUpper::HandleAllRecordingRules(), LookerUpper::HandleAllRecordings(), MetadataFactory::Lookup(), LookupFromProgramInfo(), PlaybackBox::updateGroupInfo(), and PlaybackBox::UpdateUIListItem(). Definition at line 430 of file programinfo.h. Referenced by MetadataOptions::CreateLookup(), ScheduleCommon::EditRecording(), and GuessLookupType(). Returns catType as a string. Definition at line 1811 of file programinfo.cpp. Referenced by FillProgramInfo(), HttpStatus::FillProgramInfo(), PlaybackBox::ItemLoaded(), RecordingRule::LoadByProgram(), and PlaybackBox::updateIcons(). Definition at line 432 of file programinfo.h. Referenced by ProgramRecPriority::changeRecPriority(), comp_overlap(), comp_priority(), comp_recstart(), comp_retry(), FillProgramInfo(), HttpStatus::FillProgramInfo(), TitleSort::operator()(), ProgramRecPrioritySort::operator()(), ProgramRecTypeSort::operator()(), AutoExpire::PrintExpireList(), Scheduler::PrintRec(), ProgramRecPriority::saveRecPriority(), ProgramRecPriority::scheduleChanged(), Scheduler::TryAnotherShowing(), ProgramRecPriority::updateInfo(), ProgramRecPriority::UpdateList(), and PlaybackBox::UpdateUILists(). Definition at line 433 of file programinfo.h. Referenced by comp_priority(), comp_recpriority2(), comp_retry(), StatusBox::doScheduleStatus(), ViewScheduled::FillList(), ProgDetails::loadPage(), Scheduler::PrintRec(), Scheduler::PruneRedundants(), and Scheduler::TryAnotherShowing(). Definition at line 434 of file programinfo.h. Referenced by ViewScheduled::FillList(), FillProgramInfo(), HttpStatus::FillProgramInfo(), ProgLister::HandleSelected(), ProgLister::HandleVisible(), PlaybackBox::ItemLoaded(), LookupFromProgramInfo(), ToMap(), ViewScheduled::updateInfo(), GuideGrid::updateInfo(), ProgramRecPriority::UpdateList(), and PlaybackBox::UpdateUIListItem(). Definition at line 435 of file programinfo.h. Definition at line 438 of file programinfo.h. Referenced by ProgramInfoCache::Add(), PlaybackBoxHelper::CheckAvailability(), StatusBox::customEvent(), PlaybackBox::customEvent(), MainServer::DoHandleDeleteRecording(), FillProgramInfo(), PlaybackBox::FindProgramInUILists(), Scheduler::HandleRecording(), PlaybackBox::HandleUpdateProgramInfoEvent(), PlaybackBoxHelper::LocateArtwork(), main(), PlaybackBox::Play(), PlaybackBox::PlaylistDelete(), push_onto_del(), PlaybackBox::RemoveProgram(), restore_position(), PreviewGenerator::Run(), PreviewGenerator::RunReal(), save_position(), PreviewGeneratorQueue::SendEvent(), PlaybackBox::SetItemIcons(), PlaybackBox::ShowActionPopup(), TVRec::StartRecording(), TV::StartTV(), PlaybackBox::togglePlayListItem(), ProgramInfoCache::Update(), and PlaybackBox::UpdateUILists(). Definition at line 439 of file programinfo.h. Referenced by RecordingInfo::AddHistory(), Scheduler::AddNewRecords(), Scheduler::AddRecording(), Scheduler::AssignGroupInput(), Scheduler::BackupRecStatus(), DTVRecorder::BufferedWrite(), ScheduledRecording::BuildCheckRequest(), Scheduler::BuildListMaps(), Scheduler::BuildWorkList(), Scheduler::ChangeRecordingEnd(), comp_overlap(), comp_priority(), comp_recstart(), comp_redundant(), comp_retry(), StatusBox::doScheduleStatus(), ScheduleCommon::EditRecording(), PlaybackBox::extract_job_state(), extract_main_state(), ViewScheduleDiff::fillList(), ViewScheduled::FillList(), FillProgramInfo(), HttpStatus::FillProgramInfo(), GuideUpdateProgramRow::fillProgramRowInfosWith(), Scheduler::FillRecordingDir(), TVRec::FinishedRecording(), Scheduler::GetRecStatus(), Scheduler::HandleRecording(), Scheduler::HandleRecordingStatusChange(), Scheduler::HandleReschedule(), MainServer::HandleStopRecording(), DTVRecorder::HandleTimestamps(), ProgLister::HandleVisible(), Scheduler::IsBusyRecording(), ViewScheduled::LoadList(), ProgDetails::loadPage(), Scheduler::MarkShowingsList(), Scheduler::PrintRec(), Scheduler::PruneRedundants(), Scheduler::PutInactiveSlavesToSleep(), Recording(), RemoteGetCurrentlyRecordingList(), Scheduler::SchedNewRetryPass(), SendMythSystemRecEvent(), TVRec::SetLiveRecording(), RecorderBase::SetRecordingStatus(), PlaybackBox::ShowActionPopup(), ViewScheduleDiff::showStatus(), Scheduler::SlaveConnected(), Scheduler::SlaveDisconnected(), TVRec::StartRecording(), ToMap(), Scheduler::TryAnotherShowing(), TVRec::TuningShutdowns(), ProgramRecPriority::updateInfo(), ProgramRecPriority::UpdateList(), Scheduler::UpdateNextRecord(), Scheduler::UpdateRecStatus(), IdleScreen::UpdateScreen(), and ViewScheduleDiff::updateUIList(). Definition at line 441 of file programinfo.h. Referenced by Scheduler::AddNewRecords(), Scheduler::AddRecording(), ScheduledRecording::BuildCheckRequest(), Scheduler::BuildListMaps(), Scheduler::ChangeRecordingEnd(), comp_overlap(), comp_priority(), comp_redundant(), comp_retry(), LookerUpper::CopyRuleInetrefsToRecordings(), ProgramRecPriority::deactivate(), GuideGrid::deleteRule(), ProgramRecPriority::edit(), ProgramRecPriority::FillList(), FillProgramInfo(), HttpStatus::FillProgramInfo(), GuessLookupType(), Scheduler::HandleRecordingStatusChange(), RecordingRule::LoadByProgram(), CustomEdit::loadData(), ViewScheduled::LoadList(), ProgDetails::loadPage(), ScheduleCommon::MakeOverride(), Scheduler::MarkOtherShowings(), TitleSort::operator()(), ProgramRecPrioritySort::operator()(), ProgramRecTypeSort::operator()(), ProgDetails::PowerPriorities(), Scheduler::PruneOverlaps(), Scheduler::PruneRedundants(), ScheduleCommon::QuickRecord(), ProgramRecPriority::remove(), ProgramRecPriority::RemoveItemFromList(), ProgramRecPriority::saveRecPriority(), Scheduler::SchedNewFirstPass(), ProgramRecPriority::scheduleChanged(), ScheduleEditor::ScheduleEditor(), ProgLister::ShowDeleteRuleMenu(), ProgLister::ShowMenu(), ScheduleCommon::ShowPrevious(), GuideGrid::ShowRecordingMenu(), ScheduleCommon::ShowUpcoming(), ScheduleCommon::ShowUpcomingScheduled(), TVRec::StartRecording(), Scheduler::TryAnotherShowing(), ProgramRecPriority::updateInfo(), ProgramRecPriority::UpdateList(), Scheduler::UpdateNextRecord(), and PlaybackBox::UpdateUILists(). Definition at line 442 of file programinfo.h. Referenced by ScheduledRecording::BuildCheckRequest(), Scheduler::HandleRecordingStatusChange(), Scheduler::MarkOtherShowings(), and Scheduler::UpdateNextRecord(). Definition at line 443 of file programinfo.h. Referenced by Scheduler::AddNewRecords(), Scheduler::ChangeRecordingEnd(), comp_overlap(), comp_priority(), comp_retry(), ScheduleCommon::customEvent(), ViewScheduled::deleteRule(), GuideGrid::deleteRule(), StatusBox::doScheduleStatus(), ScheduleCommon::EditRecording(), FillProgramInfo(), HttpStatus::FillProgramInfo(), GuideUpdateProgramRow::fillProgramRowInfosWith(), Scheduler::HandleRecordingStatusChange(), IsDuplicateProgram(), ScheduleCommon::IsFindApplicable(), ProgDetails::loadPage(), Scheduler::MarkOtherShowings(), Scheduler::MarkShowingsList(), ProgramRecPriority::newTemplate(), TVRec::NotifySchedulerOfRecording(), Scheduler::PrintRec(), ProgramRecPriority::remove(), ProgLister::ShowDeleteRuleMenu(), ViewScheduleDiff::showStatus(), TVRec::StartRecording(), ToMap(), Scheduler::TryAnotherShowing(), ProgramRecPriority::updateInfo(), ProgramRecPriority::UpdateList(), Scheduler::UpdateNextRecord(), and Scheduler::UpdateRecStatus(). Where should we check for duplicates? Definition at line 447 of file programinfo.h. Referenced by Scheduler::AddNewRecords(), FillProgramInfo(), and HttpStatus::FillProgramInfo(). What should be compared to determine if two programs are the same? Definition at line 451 of file programinfo.h. Referenced by Scheduler::AddNewRecords(), ScheduleCommon::EditRecording(), FillProgramInfo(), and HttpStatus::FillProgramInfo(). Definition at line 454 of file programinfo.h. Referenced by TV::CommitQueuedInput(), StatusBox::doScheduleStatus(), HttpStatus::FillChannelInfo(), get_chanid(), Scheduler::HandleRecording(), and TVRec::StartRecording(). Definition at line 455 of file programinfo.h. Referenced by Scheduler::AddNewRecords(), Scheduler::AddRecording(), Scheduler::AssignGroupInput(), Scheduler::BuildListMaps(), Scheduler::ChangeRecordingEnd(), comp_overlap(), comp_priority(), comp_retry(), StatusBox::doScheduleStatus(), HttpStatus::FillChannelInfo(), ViewScheduleDiff::fillList(), ViewScheduled::FillList(), FillProgramInfo(), HttpStatus::FillProgramInfo(), Scheduler::FillRecordingDir(), Scheduler::FindConflict(), Scheduler::FindNextConflict(), TVRec::FinishedRecording(), Scheduler::HandleRecording(), Scheduler::HandleWakeSlave(), Scheduler::IsBusyRecording(), ViewScheduled::LoadList(), Scheduler::PrintRec(), Scheduler::PutInactiveSlavesToSleep(), TVRec::RecordPending(), Scheduler::SchedLiveTV(), Scheduler::SchedNewRetryPass(), SendMythSystemRecEvent(), TVRec::SetLiveRecording(), RecorderBase::SetRecordingStatus(), Scheduler::SlaveConnected(), Scheduler::SlaveDisconnected(), Scheduler::TryAnotherShowing(), TVRec::TuningNewRecorder(), TVRec::TuningSignalCheck(), Scheduler::UpdateRecStatus(), and ViewScheduleDiff::updateUIList(). Definition at line 456 of file programinfo.h. Referenced by FillProgramInfo(), RecordingInfo::InsertProgram(), ProgDetails::loadPage(), and RecordingInfo::SubstituteMatches(). Definition at line 457 of file programinfo.h. Referenced by Scheduler::PrintRec(), and ToMap(). Definition at line 460 of file programinfo.h. Definition at line 462 of file programinfo.h. Referenced by RecordingRule::AssignProgramInfo(), ScheduledRecording::BuildCheckRequest(), ScheduleCommon::EditRecording(), ProgDetails::loadPage(), and Scheduler::MarkOtherShowings(). Definition at line 464 of file programinfo.h. Referenced by PlaybackBox::extract_commflag_state(), FillProgramInfo(), HttpStatus::FillProgramInfo(), LookupFromProgramInfo(), PlaybackBox::SetItemIcons(), and PlaybackBox::updateIcons(). Definition at line 465 of file programinfo.h. Definition at line 467 of file programinfo.h. Definition at line 1837 of file programinfo.cpp. Referenced by RecordingInfo::AddHistory(), and ScheduleCommon::EditRecording(). Definition at line 469 of file programinfo.h. Definition at line 470 of file programinfo.h. Referenced by HttpStatus::FillChannelInfo(), init_jobs(), JobQueue::QueueRecordingJobs(), and TVRec::StartedRecording(). Definition at line 471 of file programinfo.h. Referenced by JobQueue::DoTranscodeThread(), RecordingSelector::OKPressed(), PlaybackBox::SetItemIcons(), RecordingSelector::titleChanged(), and RecordingSelector::updateRecordingList(). Definition at line 472 of file programinfo.h. Referenced by PlaybackBox::createPlayFromMenu(), PlaybackBox::SetItemIcons(), and PlaybackBox::ShowActionPopup(). Definition at line 473 of file programinfo.h. Referenced by MainServer::customEvent(), AutoExpire::ExpireEpisodesOverMax(), PlaybackBox::SetItemIcons(), PlaybackBox::ShowActionPopup(), PlaybackBox::toggleWatched(), and PlaybackBox::UpdateUILists(). Definition at line 474 of file programinfo.h. Referenced by PlaybackBox::createStorageMenu(), PlaybackBox::doPlaylistExpireSetting(), PlaybackBox::SetItemIcons(), PlaybackBox::toggleAutoExpire(), and PlaybackBox::UpdateUILists(). Definition at line 475 of file programinfo.h. Referenced by PlaybackBox::createStorageMenu(), PlaybackBox::SetItemIcons(), and PlaybackBox::togglePreserveEpisode(). Definition at line 476 of file programinfo.h. Referenced by ClearBookmarks(), ClearMarkupMap(), ClearPositionMap(), ClearSeekTable(), getCutFrames(), GetPlaybackURL(), internal_play_media(), MythPlayer::IsNearEnd(), QueryKeyFrameInfo(), QueryMarkup(), QueryMarkupMap(), QueryPositionMap(), SaveMarkup(), SaveMarkupMap(), SavePositionMap(), SavePositionMapDelta(), TV::ShowOSDStopWatchingRecording(), and ToMap(). Definition at line 477 of file programinfo.h. Referenced by ClearMarkupMap(), ClearPositionMap(), TV::HandleStateChange(), MarkAsInUse(), TV::Playback(), TV::ProcessNetworkControlCommand(), QueryIsDeleteCandidate(), QueryIsInUse(), QueryKeyFrameInfo(), QueryMarkup(), QueryMarkupMap(), QueryPositionMap(), SaveAspect(), SaveBookmark(), SaveCutList(), SaveFrameRate(), SaveMarkup(), SaveMarkupMap(), SavePositionMap(), SavePositionMapDelta(), SaveResolution(), SaveTotalDuration(), SaveTotalFrames(), SaveWatched(), PlayerContext::SetInitialTVState(), MythPlayer::SetWatched(), TV::ShowOSDPromptDeleteRecording(), TV::StartTV(), and UpdateInUseMark(). Definition at line 478 of file programinfo.h. Referenced by Scheduler::AddNewRecords(), FillProgramInfo(), HttpStatus::FillProgramInfo(), RecordingInfo::InsertProgram(), ProgDetails::loadPage(), and ToMap(). Definition at line 479 of file programinfo.h. Referenced by ProgLister::customEvent(), PrevRecordedList::ShowItemMenu(), ProgLister::ShowOldRecordedMenu(), and ToMap(). Definition at line 480 of file programinfo.h. Referenced by Scheduler::AddNewRecords(), comp_priority(), comp_retry(), and RecordingInfo::SubstituteMatches(). Definition at line 481 of file programinfo.h. Referenced by Dvr::GetRecordedList(), and PlaybackBox::UpdateUILists(). Definition at line 484 of file programinfo.h. Referenced by FillProgramInfo(), PlaybackBox::ItemLoaded(), LookupFromProgramInfo(), ToMap(), ToStringList(), and PlaybackBox::updateIcons(). Definition at line 486 of file programinfo.h. Referenced by StatusBox::doScheduleStatus(), extract_main_state(), FillProgramInfo(), PlaybackBox::ItemLoaded(), LookupFromProgramInfo(), SaveVideoProperties(), ToMap(), ToStringList(), and PlaybackBox::updateIcons(). Definition at line 488 of file programinfo.h. const QString & grp = "\""
Definition at line 1846 of file programinfo.cpp. Referenced by PlaybackBox::deleteSelected(), StatusBox::doAutoExpireList(), JobQueue::DoFlagCommercialsThread(), LiveTVChain::DoGetNextProgram(), MainServer::DoHandleDeleteRecording(), JobQueue::DoMetadataLookupThread(), JobQueue::DoTranscodeThread(), JobQueue::DoUserJobThread(), ScheduleCommon::EditRecording(), AutoExpire::ExpireRecordings(), extract_subtitle(), PreviewGeneratorQueue::GeneratePreviewImage(), TVRec::GetProgramRingBufferForLiveTV(), MainServer::HandleGenPreviewPixmap(), TV::HandleJumpToProgramAction(), MainServer::HandleQueryRecordings(), Scheduler::HandleRecording(), RecordingInfo::InsertProgram(), ProgDetails::loadPage(), TV::PrepToSwitchToRecordedProgram(), AutoExpire::PrintExpireList(), Scheduler::PrintRec(), SetAvailableStatus(), PlaybackBox::ShowAvailabilityPopup(), ProgLister::ShowOldRecordedMenu(), ViewScheduleDiff::showStatus(), TVRec::StartRecording(), SubstituteMatches(), ToMap(), TuningRequest::toString(), Scheduler::UpdateRecStatus(), and PlaybackBox::UpdateUIListItem(). Definition at line 1149 of file programinfo.cpp. Referenced by MythBDPlayer::EventStart(), MythDVDPlayer::EventStart(), PrevRecordedList::LoadDates(), ProgramRecPriority::scheduleChanged(), and PlaybackBox::UpdateUILists(). Definition at line 1156 of file programinfo.cpp. Definition at line 504 of file programinfo.h. Referenced by internal_play_media(), and SetPathname(). Definition at line 2353 of file programinfo.cpp. Referenced by EncoderLink::CheckFile(), PlaybackSock::CheckFile(), PlaybackBox::customEvent(), JobQueue::DoFlagCommercialsThread(), LiveTVChain::EntryToProgram(), AutoExpire::ExpireRecordings(), Scheduler::FillRecordingDir(), Content::GetPreviewImage(), getProgramInfoForFile(), TVRec::GetProgramRingBufferForLiveTV(), MainServer::HandleGenPreviewPixmap(), MainServer::HandlePixmapLastModified(), MainServer::HandleQueryRecordings(), Scheduler::HandleRecording(), LoadProgramFromRecorded(), preview_helper(), JobQueue::ProcessJob(), PlaybackBox::processNetworkControlCommand(), ProgramInfo(), RebuildSeekTable(), RemoteCheckFile(), SaveBasename(), and MainServer::TruncateAndClose(). Definition at line 507 of file programinfo.h. Referenced by TVRec::GetProgramRingBufferForLiveTV(), and UPnpCDSTv::LoadRecordings(). Definition at line 508 of file programinfo.h. Definition at line 509 of file programinfo.h. Referenced by RecordingInfo::ApplyNeverRecord(), GuideUpdateProgramRow::fillProgramRowInfosWith(), TVRec::GetProgramRingBufferForLiveTV(), and RecordingInfo::RecordingInfo(). Definition at line 510 of file programinfo.h. Referenced by TVRec::GetProgramRingBufferForLiveTV(), Scheduler::HandleRecording(), PrevRecordedList::LoadDates(), UPnpCDSTv::LoadRecordings(), Scheduler::SchedLiveTV(), PlaybackSock::StartRecording(), and TVRec::StartRecording(). Definition at line 511 of file programinfo.h. Referenced by Scheduler::ChangeRecordingEnd(), TVRec::FinishedRecording(), TVRec::GetProgramRingBufferForLiveTV(), RecordingInfo::RecordingInfo(), Scheduler::SchedLiveTV(), TVRec::StartRecording(), and Scheduler::UpdateRecStatus(). Definition at line 512 of file programinfo.h. Referenced by TVRec::CheckForRecGroupChange(), TVRec::FinishedRecording(), TVRec::GetProgramRingBufferForLiveTV(), and TVRec::SetLiveRecording(). Definition at line 513 of file programinfo.h. Definition at line 514 of file programinfo.h. Definition at line 515 of file programinfo.h. Definition at line 6094 of file programinfo.cpp. Referenced by PlaybackBox::customEvent(), MainServer::HandleQueryRecordings(), SaveFilesize(), and RecordingInfo::SetFilesize(). Definition at line 517 of file programinfo.h. Definition at line 518 of file programinfo.h. Referenced by PrevRecordedList::DeleteOldSeries(), and ProgLister::DeleteOldSeries(). Definition at line 519 of file programinfo.h. Definition at line 520 of file programinfo.h. Definition at line 521 of file programinfo.h. Definition at line 522 of file programinfo.h. Referenced by Scheduler::AddNewRecords(), Scheduler::PruneRedundants(), and PlaybackBox::UpdateUILists(). Definition at line 523 of file programinfo.h. Referenced by Scheduler::ChangeRecordingEnd(), ProgramRecPriority::scheduleChanged(), and TVRec::StartRecording(). Definition at line 524 of file programinfo.h. Definition at line 525 of file programinfo.h. Referenced by Scheduler::AssignGroupInput(), TVRec::GetProgramRingBufferForLiveTV(), TVRec::GetRecording(), MainServer::HandleRecorderQuery(), Scheduler::HandleRecording(), MainServer::HandleRemoteEncoder(), TVRec::NotifySchedulerOfRecording(), Scheduler::PruneRedundants(), MainServer::reconnectTimeout(), Scheduler::SchedLiveTV(), and TVRec::TuningRestartRecorder(). Definition at line 526 of file programinfo.h. Definition at line 531 of file programinfo.h. Referenced by PlaybackBox::doJobQueueJob(), DeleteMap::SetFileEditing(), and PlaybackBox::stopPlaylistJobQueueJob(). Definition at line 536 of file programinfo.h. Referenced by PlaybackBox::doJobQueueJob(), and PlaybackBox::stopPlaylistJobQueueJob(). If "ignore" is true GetBookmark() will return 0, otherwise GetBookmark() will return the bookmark position if it exists. Definition at line 543 of file programinfo.h. Referenced by MythPlayer::EventStart(), and TV::StartTV(). If "ignore" is true QueryProgStart() will return 0, otherwise QueryProgStart() will return the progstart position if it exists. Definition at line 550 of file programinfo.h. Referenced by MythPlayer::EventStart(), PreviewGenerator::LocalPreviewRun(), and TV::StartTV(). If "ignore" is true QueryLastPlayPos() will return 0, otherwise QueryLastPlayPos() will return the last playback position if it exists. Definition at line 558 of file programinfo.h. Definition at line 563 of file programinfo.h. Referenced by PlaybackSock::StartRecording(), and TVRec::StartRecording(). Definition at line 565 of file programinfo.h. Referenced by Scheduler::AddNewRecords(), RecordingInfo::ApplyNeverRecord(), Scheduler::ChangeRecordingEnd(), PlaybackBox::customEvent(), MainServer::customEvent(), MainServer::DoHandleStopRecording(), TVRec::FinishedRecording(), TVRec::GetRecording(), Scheduler::HandleRecording(), Scheduler::HandleRecordingStatusChange(), Scheduler::MarkShowingsList(), TVRec::NotifySchedulerOfRecording(), Scheduler::PruneRedundants(), Scheduler::RestoreRecStatus(), TVRec::RingBufferChanged(), TVRec::run(), Scheduler::SchedLiveTV(), Scheduler::SchedNewFirstPass(), Scheduler::SchedNewRetryPass(), RecorderBase::SetRecordingStatus(), Scheduler::SlaveConnected(), Scheduler::SlaveDisconnected(), TVRec::SwitchRecordingRingBuffer(), TVRec::TeardownRecorder(), Scheduler::TryAnotherShowing(), TVRec::TuningFrequency(), TVRec::TuningNewRecorder(), TVRec::TuningSignalCheck(), and Scheduler::UpdateRecStatus(). Definition at line 566 of file programinfo.h. Referenced by Scheduler::ChangeRecordingEnd(), TVRec::NotifySchedulerOfRecording(), ProgramRecPriority::scheduleChanged(), and TVRec::StartRecording(). Definition at line 567 of file programinfo.h. Gets the basename, from the DB if necessary. Definition at line 2423 of file programinfo.cpp. Referenced by CompleteJob(), and GetPlaybackURL(). Queries multiplex any recording would be made on, zero if unknown. Definition at line 2559 of file programinfo.cpp. Referenced by Scheduler::AddRecording(), Scheduler::SchedLiveTV(), Scheduler::SlaveConnected(), and TVRec::StartRecording(). Queries Latest bookmark timestamp from the database. If the timestamp has not been set this returns an invalid QDateTime. Definition at line 2637 of file programinfo.cpp. Gets any bookmark position in database, unless the ignore bookmark flag is set. Bookmark position in frames if the query is executed and succeeds, zero otherwise. Definition at line 2664 of file programinfo.cpp. Referenced by Dvr::GetSavedBookmark(), MainServer::HandleBookmarkQuery(), internal_play_media(), and PreviewGenerator::LocalPreviewRun(). Gets any progstart position in database, unless the ignore progstart flag is set. Progstart position in frames if the query is executed and succeeds, zero otherwise. Definition at line 2691 of file programinfo.cpp. Gets any lastplaypos position in database, unless the ignore lastplaypos flag is set. LastPlayPos position in frames if the query is executed and succeeds, zero otherwise. Definition at line 2708 of file programinfo.cpp. Referenced by PlaybackBox::createPlayFromMenu(), and PlaybackBox::ShowActionPopup(). Queries recordedprogram to get the category_type of the recording. Definition at line 2865 of file programinfo.cpp. Queries "dvdbookmark" table for bookmarking DVD serial number. Deletes old dvd bookmarks if "delbookmark" is set. Definition at line 2724 of file programinfo.cpp. Referenced by MythDVDPlayer::GetBookmark(), and internal_play_media(). Queries "bdbookmark" table for bookmarking BD serial number. Definition at line 2801 of file programinfo.cpp. Referenced by MythBDPlayer::GetBookmark(), and internal_play_media(). Queries "recorded" table for its "editing" field and returns true if it is set to true. true if we have started, but not finished, editing. Definition at line 2940 of file programinfo.cpp. Referenced by DeleteMap::IsFileEditing(), TV::StartProgramEditMode(), and Transcode::TranscodeFile(). Returns true if Program is in use. This is determined by the inuseprograms table which is updated automatically by NuppelVideoPlayer. Definition at line 3019 of file programinfo.cpp. Referenced by PlaybackBox::deleteSelected(), QueryIsDeleteCandidate(), QueryIsInUse(), PlaybackBox::ShowAvailabilityPopup(), and TV::ShowOSDPromptDeleteRecording(). Definition at line 3081 of file programinfo.cpp. Returns true iff this is a recording, it is not in use (except by the recorder), and at most one player iff one_playback_allowed is set. one_playback_allowed iff true still returns true if there is one playback in progress and all other checks pass. Definition at line 3098 of file programinfo.cpp. Referenced by StatusBox::customEvent(), PlaybackBox::deleteSelected(), TV::IsDeleteAllowed(), PlaybackBox::PlaylistDelete(), PlaybackBox::RemoveProgram(), and TV::ShowOSDPromptDeleteRecording(). Returns "autoexpire" field from "recorded" table. Definition at line 3285 of file programinfo.cpp. Referenced by TV::IsBookmarkAllowed(), MythPlayer::OpenFile(), TV::PlaybackMenuInit(), TV::QuickRecord(), PlaybackBox::ShowDeletePopup(), and TV::ToggleAutoExpire(). Returns the "transcoded" field in "recorded" table. Definition at line 3131 of file programinfo.cpp. Returns the channel and input needed to record the program. Ideally this would return a the chanid & input, since we do not enforce a uniqueness constraint on channum in the DB. Definition at line 5069 of file programinfo.cpp. Referenced by TVRec::IsBusy(), and TVRec::TuningGetChanNum(). If present in recording this loads average width of the main video stream from database's stream markup table. Saves loaded value for future reference by GetWidth(). Definition at line 4274 of file programinfo.cpp. Referenced by doUpgradeTVDatabaseSchema(), and RecorderBase::FinishRecording(). If present in recording this loads average height of the main video stream from database's stream markup table. Saves loaded value for future reference by GetHeight(). Definition at line 4265 of file programinfo.cpp. Referenced by doUpgradeTVDatabaseSchema(), TVRec::FinishedRecording(), and RecorderBase::FinishRecording(). If present in recording this loads average frame rate of the main video stream from database's stream markup table. Saves loaded value for future reference by GetFrameRate(). Definition at line 4283 of file programinfo.cpp. Definition at line 4288 of file programinfo.cpp. If present this loads the total duration in milliseconds of the main video stream from recordedmarkup table in the database. Definition at line 4338 of file programinfo.cpp. Referenced by UPnpCDSTv::LoadRecordings(), and AvFormatDecoder::OpenFile(). If present in recording this loads total frames of the main video stream from database's stream markup table. Definition at line 4358 of file programinfo.cpp. Definition at line 4783 of file programinfo.cpp. Referenced by TVRec::CheckForRecGroupChange(), and TVRec::FinishedRecording(). Returns true iff the speficied mark type is set on frame 0. Definition at line 3583 of file programinfo.cpp. Definition at line 4799 of file programinfo.cpp. Referenced by JobQueue::DoTranscodeThread(), and JobQueue::GetJobCommand(). Returns last frame in position map or 0. Definition at line 1817 of file programinfo.cpp. Definition at line 1883 of file programinfo.cpp. Sets recording file size in database, and sets "filesize" field. Definition at line 6104 of file programinfo.cpp. Referenced by CompleteJob(), JobQueue::DoTranscodeThread(), MainServer::HandleQueryRecordings(), RecordingInfo::SaveFilesize(), and UpdateFileSize(). Clears any existing bookmark in DB and if frame is greater than 0 sets a new bookmark. Definition at line 2584 of file programinfo.cpp. Referenced by PlaybackBox::ClearBookmark(), CompleteJob(), MainServer::HandleSetBookmark(), MythPlayer::SetBookmark(), and Dvr::SetSavedBookmark(). Definition at line 2757 of file programinfo.cpp. Definition at line 2819 of file programinfo.cpp. Sets "editing" field in "recorded" table to "edit". edit Editing state to set. Definition at line 2966 of file programinfo.cpp. Referenced by MythPlayer::DisableEdit(), MythPlayer::EnableEdit(), and TV::HandleOSDAlreadyEditing(). Set "transcoded" field in "recorded" table to "trans". Also sets the FL_TRANSCODED flag if the status is TRASCODING_COMPLETE and clears it otherwise. trans value to set transcoded field to. Definition at line 3151 of file programinfo.cpp. Set "watched" field in recorded/videometadata to "watchedFlag". Definition at line 2888 of file programinfo.cpp. Referenced by PlaybackBox::doPlaylistWatchedSetting(), MythPlayer::SetWatched(), PlaybackBox::toggleWatched(), and Dvr::UpdateRecordedWatchedStatus(). Set "deletepending" field in "recorded" table to "deleteFlag". deleteFlag value to set delete pending field to. Definition at line 2991 of file programinfo.cpp. Referenced by MainServer::DoDeleteThread(), and MainServer::DoHandleDeleteRecording(). Set "commflagged" field in "recorded" table to "flag". flag value to set commercial flagging field to. Definition at line 3174 of file programinfo.cpp. Referenced by CompleteJob(), DoFlagCommercials(), and TVRec::StartedRecording(). Set "autoexpire" field in "recorded" table to "autoExpire". autoExpire value to set auto expire field to. Definition at line 3227 of file programinfo.cpp. Referenced by TVRec::CreateLiveTVRingBuffer(), StatusBox::customEvent(), MainServer::DoHandleDeleteRecording(), MainServer::DoHandleUndeleteRecording(), PlaybackBox::doPlaylistExpireSetting(), TV::QuickRecord(), PlaybackBox::setRecGroup(), TVRec::SwitchLiveTVRingBuffer(), PlaybackBox::toggleAutoExpire(), TV::ToggleAutoExpire(), and TVRec::TuningRestartRecorder(). Set "preserve" field in "recorded" table to "preserveEpisode". preserveEpisode value to set preserve field to. Definition at line 3200 of file programinfo.cpp. Sets a recording's basename in the database. Definition at line 2383 of file programinfo.cpp. Store aspect ratio of a frame in the recordedmark table. Definition at line 4072 of file programinfo.cpp. Store the Resolution at frame in the recordedmarkup table. Definition at line 4191 of file programinfo.cpp. Store the Frame Rate at frame in the recordedmarkup table. Definition at line 4102 of file programinfo.cpp. Store the Total Duration at frame 0 in the recordedmarkup table. Definition at line 4125 of file programinfo.cpp. Referenced by RecordingInfo::FinishedRecording(), DecoderBase::SaveTotalDuration(), and RecorderBase::SetDuration(). Store the Total Frames at frame 0 in the recordedmarkup table. Definition at line 4157 of file programinfo.cpp. Referenced by DecoderBase::SaveTotalFrames(), and RecorderBase::SetTotalFrames(). Definition at line 4632 of file programinfo.cpp. Referenced by TVRec::FinishedRecording(), RecorderBase::FinishRecording(), RecorderBase::SetRecordingStatus(), and TVRec::TuningSignalCheck(). Clears the specified flag, then if sets it. Definition at line 3593 of file programinfo.cpp. Referenced by DoFlagCommercials(), and DeleteMap::SaveMap(). Definition at line 621 of file programinfo.h. Referenced by ClearBookmarks(), ClearSeekTable(), and Transcode::TranscodeFile(). Set or unset the record.last_delete field. setTime to set or clear the time stamp. Definition at line 3253 of file programinfo.cpp. Referenced by MainServer::DoHandleUndeleteRecording(), PlaybackBox::RemoveProgram(), SaveAutoExpire(), SavePreserve(), and SaveWatched(). const QString & usedFor = ""
Tracks a recording's in use status, to prevent deletion and to allow the storage scheduler to perform IO load balancing. Definition at line 4875 of file programinfo.cpp. Referenced by TVRec::CreateLiveTVRingBuffer(), FileTransfer::FileTransfer(), PreviewGenerator::LocalPreviewRun(), JobQueue::ProcessJob(), JobQueue::RemoveRunningJob(), TVRec::RingBufferChanged(), PlayerContext::SetPlayingInfo(), TVRec::StartRecording(), TVRec::SwitchLiveTVRingBuffer(), TVRec::SwitchRecordingRingBuffer(), TVRec::TeardownRecorder(), MainServer::TruncateAndClose(), TVRec::TuningNewRecorder(), TVRec::TuningRestartRecorder(), TVRec::TuningShutdowns(), UpdateInUseMark(), and FileTransfer::~FileTransfer(). Definition at line 4683 of file programinfo.cpp. Referenced by MythPlayer::EventLoop(), FileTransfer::GetFileSize(), MythPlayer::GetRawVideoFrame(), FileTransfer::Pause(), FileTransfer::RequestBlock(), MythCCExtractorPlayer::run(), TVRec::run(), FileTransfer::Seek(), FileTransfer::SetTimeout(), FileTransfer::Stop(), MythPlayer::TranscodeGetNextFrame(), MainServer::TruncateAndClose(), FileTransfer::Unpause(), and FileTransfer::WriteBlock(). Definition at line 4700 of file programinfo.cpp. Referenced by LookerUpper::customEvent(), and PlaybackBox::saveRecMetadata(). Definition at line 4724 of file programinfo.cpp. Referenced by LookerUpper::CopyRuleInetrefsToRecordings(), LookerUpper::customEvent(), and PlaybackBox::saveRecMetadata(). Definition at line 4819 of file programinfo.cpp. Referenced by Scheduler::FillRecordingDir(), and MarkAsInUse(). Returns filename or URL to be used to play back this recording. If the file is accessible locally, the filename will be returned, otherwise a myth:// URL will be returned. Definition at line 2461 of file programinfo.cpp. Referenced by CheckRecordings(), CompleteJob(), commDetector2::debugDirectory(), DiscoverRecordingDirectory(), JobQueue::DoFlagCommercialsThread(), JobQueue::DoTranscodeThread(), get_filename(), GetPlaybackURL(), getProgramInfoForFile(), TV::HandleStateChange(), internal_play_media(), IsFileReadable(), MythPlayer::JumpToProgram(), main(), MarkAsInUse(), RecordingSelector::OKPressed(), preview_helper(), JobQueue::ProcessJob(), PlaybackBox::processNetworkControlCommand(), RunCCExtract(), SubstituteMatches(), TV::SwitchInputs(), MythPlayer::SwitchToProgram(), and RecordingSelector::updateSelectedList(). Definition at line 2361 of file programinfo.cpp. Definition at line 3301 of file programinfo.cpp. Referenced by FillCutList(), getCutFrames(), GetMarkupList(), DeleteMap::IsSaved(), DeleteMap::LoadAutoSaveMap(), ThumbFinder::loadCutList(), DeleteMap::LoadMap(), main(), and Transcode::TranscodeFile(). Definition at line 3333 of file programinfo.cpp. Referenced by CopySkipListToCutList(), DeleteMap::SaveMap(), SetCutList(), and SetMarkupList(). Definition at line 3387 of file programinfo.cpp. Referenced by CopySkipListToCutList(), FillCommBreak(), GetMarkupList(), MainServer::HandleCutMapQuery(), and CommBreakMap::LoadMap(). Definition at line 3380 of file programinfo.cpp. Referenced by ClearSkipList(), DoFlagCommercials(), and SetMarkupList(). Definition at line 3601 of file programinfo.cpp. Referenced by CheckRecordings(), FillSeek(), getFrameCount(), DecoderBase::PosMapFromDb(), and QueryLastFrameInPosMap(). Definition at line 3647 of file programinfo.cpp. Referenced by ClearSeekTable(), DTVRecorder::Reset(), NuppelVideoRecorder::Reset(), Transcode::TranscodeFile(), and UpdatePositionMap(). Definition at line 3685 of file programinfo.cpp. Definition at line 3831 of file programinfo.cpp. Referenced by RecorderBase::SavePositionMap(), and DecoderBase::SavePositionMapDelta(). Definition at line 3953 of file programinfo.cpp. Referenced by QueryDurationKeyFrame(), QueryKeyFrameDuration(), QueryKeyFramePosition(), and QueryPositionKeyFrame(). Definition at line 4041 of file programinfo.cpp. Referenced by FillCommBreak(), FillCutList(), and Dvr::GetSavedBookmark(). Definition at line 4032 of file programinfo.cpp. Definition at line 4059 of file programinfo.cpp. Definition at line 4050 of file programinfo.cpp. Definition at line 4364 of file programinfo.cpp. Definition at line 4445 of file programinfo.cpp. Sends event out that the ProgramInfo should be reloaded. Definition at line 2619 of file programinfo.cpp. Referenced by RecordingInfo::ApplyRecordPlayGroupChange(), RecordingInfo::ApplyRecordRecGroupChange(), RecordingInfo::ApplyRecordRecTitleChange(), RecordingInfo::ApplyStorageGroupChange(), JobQueue::DoFlagCommercialsThread(), JobQueue::DoMetadataLookupThread(), JobQueue::DoUserJobThread(), RecordingInfo::FinishedRecording(), MarkAsInUse(), SaveAutoExpire(), SaveBasename(), SaveBookmark(), SaveCommFlagged(), SaveDeletePendingFlag(), SaveEditing(), SaveInetRef(), SavePreserve(), SaveSeasonEpisode(), SaveTranscodeStatus(), SaveVideoProperties(), SaveWatched(), and RecordingInfo::UpdateRecordingEnd(). Sends event out that the ProgramInfo should be added to lists. Definition at line 2624 of file programinfo.cpp. Referenced by SaveDeletePendingFlag(), and RecordingInfo::StartedRecording(). Sends event out that the ProgramInfo should be delete from lists. Definition at line 2629 of file programinfo.cpp. Translations for play,recording, & storage groups +. Translations for play,recording, & storage groups. Definition at line 5178 of file programinfo.cpp. Referenced by CurrentPlaybackProfile(), StatusBox::doAutoExpireList(), PlaybackBox::fillRecGroupPasswordCache(), ProgDetails::loadPage(), PlaybackBox::PlaybackBox(), PlaybackBox::setGroupFilter(), PlaybackBox::showGroupFilter(), PlaybackBox::updateGroupInfo(), PlaybackBox::UpdateUIGroupList(), and PlaybackBox::UpdateUIRecGroupList(). Creates a unique string that can be used to identify a recording. Definition at line 1164 of file programinfo.cpp. Extracts chanid and recstartts from a unique key generated by MakeUniqueKey(). true iff a valid chanid and recstartts have been extracted. Definition at line 1173 of file programinfo.cpp. Referenced by TV::customEvent(), and incomingCustomEvent(). Definition at line 1184 of file programinfo.cpp. Definition at line 1206 of file programinfo.cpp. Referenced by preview_helper(), and ProgramInfo(). Definition at line 1229 of file programinfo.cpp. Definition at line 4766 of file programinfo.cpp. Definition at line 2675 of file programinfo.cpp. Definition at line 5242 of file programinfo.cpp. Referenced by LookerUpper::CopyRuleInetrefsToRecordings(), Dvr::GetRecordedList(), LookerUpper::HandleAllArtwork(), LookerUpper::HandleAllRecordings(), and MainServer::HandleQueryRecordings(). Definition at line 5278 of file programinfo.cpp. Definition at line 5306 of file programinfo.cpp. Referenced by GetNextRecordingList(), LoadFromScheduler(), LoadProgramFromProgram(), and RecordingInfo::RecordingInfo(). Definition at line 3502 of file programinfo.cpp. Referenced by QueryBookmark(), QueryCommBreakList(), QueryCutList(), QueryLastPlayPos(), QueryMarkupFlag(), and QueryProgStart(). Definition at line 3434 of file programinfo.cpp. Referenced by SaveBookmark(), SaveCommBreakList(), SaveCutList(), SaveMarkupFlag(), and RecorderBase::TryWriteProgStartMark(). Definition at line 3393 of file programinfo.cpp. Referenced by TV::PrepareToExitPlayer(), SaveBookmark(), SaveCommBreakList(), SaveCutList(), and SaveMarkupFlag(). Returns a filename for a recording based on the recording channel and date. Definition at line 2307 of file programinfo.cpp. Loads ProgramInfo for an existing recording. Definition at line 1897 of file programinfo.cpp. Uses a QStringList to initialize this ProgramInfo instance. it Iterator pointing to first item in list to treat as beginning of serialized ProgramInfo. true if it succeeds, false if it fails. Definition at line 1389 of file programinfo.cpp. Definition at line 3519 of file programinfo.cpp. Definition at line 3550 of file programinfo.cpp. Definition at line 5169 of file programinfo.cpp. Definition at line 2366 of file programinfo.cpp. Referenced by PlaybackBox::customEvent(), PlaybackBox::PlaylistDelete(), PlaybackBox::RemoveProgram(), and PlaybackBox::UpdateUILists(). Definition at line 810 of file programinfo.h. Referenced by PlaybackBox::customEvent(), PlaybackBox::deleteSelected(), extract_main_state(), PreviewGeneratorQueue::GeneratePreviewImage(), PlaybackBoxHelper::GetPreviewImage(), PlaybackBox::ItemVisible(), PlaybackBox::Play(), PlaybackBox::popupClosed(), PlaybackBox::RemoveProgram(), PlaybackBox::ShowActionPopup(), PlaybackBox::ShowAvailabilityPopup(), and PlaybackBox::ShowMenu(). Definition at line 44 of file programinfo.cpp. Definition at line 736 of file programinfo.h. Referenced by RecordingInfo::AddHistory(), RecordingInfo::ApplyRecordRecTitleChange(), TV::AskAllowRecording(), clear(), clone(), RecordingInfo::DeleteHistory(), ensureSortFields(), RecordingInfo::FinishedRecording(), RecordingInfo::ForgetHistory(), FromStringList(), RecordingInfo::InsertProgram(), IsDuplicateProgram(), IsSameProgram(), IsSameProgramWeakCheck(), IsSameTitleStartTimeAndChannel(), IsSameTitleTimeslotAndChannel(), LoadProgramFromRecorded(), operator==(), ProgramInfo(), RecordingInfo::ReactivateRecording(), RecordingInfo::RecordingInfo(), SaveWatched(), RecordingInfo::SetDupHistory(), SetTitle(), RecordingInfo::StartedRecording(), SubstituteMatches(), ToMap(), toString(), and ToStringList(). Definition at line 737 of file programinfo.h. Referenced by clear(), clone(), ensureSortFields(), ProgramInfo(), SetTitle(), and ToMap(). Definition at line 738 of file programinfo.h. Referenced by RecordingInfo::AddHistory(), RecordingInfo::ApplyRecordRecTitleChange(), clear(), clone(), ensureSortFields(), RecordingInfo::FinishedRecording(), RecordingInfo::ForgetHistory(), FromStringList(), RecordingInfo::InsertProgram(), IsDuplicateProgram(), IsGeneric(), IsSameProgram(), LoadProgramFromRecorded(), operator==(), ProgramInfo(), SaveWatched(), RecordingInfo::SetDupHistory(), SetSubtitle(), SubstituteMatches(), ToMap(), toString(), ToStringList(), ProgramRecPriority::updateInfo(), and ProgramRecPriority::UpdateList(). Definition at line 739 of file programinfo.h. Referenced by clear(), clone(), ensureSortFields(), ProgramInfo(), SetSubtitle(), and ToMap(). Definition at line 740 of file programinfo.h. Referenced by RecordingInfo::AddHistory(), RecordingInfo::ApplyRecordRecTitleChange(), clear(), clone(), RecordingInfo::ForgetHistory(), FromStringList(), RecordingInfo::InsertProgram(), IsDuplicateProgram(), IsGeneric(), IsSameProgram(), LoadProgramFromRecorded(), operator==(), ProgramInfo(), RecordingInfo::SetDupHistory(), SubstituteMatches(), ToMap(), and ToStringList(). Definition at line 741 of file programinfo.h. Referenced by RecordingInfo::AddHistory(), clear(), clone(), FromStringList(), RecordingInfo::InsertProgram(), LoadProgramFromRecorded(), operator==(), ProgramInfo(), SubstituteMatches(), ToMap(), and ToStringList(). Definition at line 742 of file programinfo.h. Definition at line 743 of file programinfo.h. Referenced by clear(), clone(), FromStringList(), LoadProgramFromRecorded(), operator==(), SubstituteMatches(), ToMap(), and ToStringList(). Definition at line 744 of file programinfo.h. Referenced by clear(), clone(), FromStringList(), LoadProgramFromRecorded(), operator==(), RecordingInfo::RecordingInfo(), SubstituteMatches(), ToMap(), and ToStringList(). Definition at line 745 of file programinfo.h. Referenced by RecordingInfo::AddHistory(), clear(), clone(), FromStringList(), RecordingInfo::InsertProgram(), LoadProgramFromRecorded(), operator==(), SubstituteMatches(), ToMap(), and ToStringList(). Definition at line 746 of file programinfo.h. Referenced by clear(), clone(), operator==(), ProgramInfo(), and ToMap(). Definition at line 748 of file programinfo.h. Referenced by ProgramRecPriority::changeRecPriority(), clear(), clone(), FromStringList(), LoadProgramFromRecorded(), operator==(), ProgramInfo(), RecordingInfo::RecordingInfo(), ToMap(), and ToStringList(). Definition at line 750 of file programinfo.h. Referenced by RecordingInfo::AddHistory(), RecordingInfo::ApplyRecordPlayGroupChange(), RecordingInfo::ApplyRecordRecGroupChange(), RecordingInfo::ApplyRecordRecID(), RecordingInfo::ApplyRecordRecTitleChange(), RecordingInfo::ApplyStorageGroupChange(), RecordingInfo::ApplyTranscoderProfileChange(), RecordingInfo::ApplyTranscoderProfileChangeById(), clear(), ClearMarkupMap(), ClearPositionMap(), RecordingInfo::clone(), clone(), CreateRecordBasename(), DiscoverProgramInfoType(), RecordingInfo::FinishedRecording(), RecordingInfo::ForgetHistory(), FromStringList(), GetFilesize(), RecordingInfo::InsertProgram(), IsSameChannel(), IsSameProgramWeakCheck(), IsSameRecording(), LoadProgramFromRecorded(), MarkAsInUse(), operator==(), ProgramInfo(), QueryAutoExpire(), QueryAverageAspectRatio(), QueryAverageFrameRate(), QueryAverageHeight(), QueryAverageWidth(), QueryBookmarkTimeStamp(), QueryCategoryType(), QueryIsEditing(), QueryIsInUse(), QueryKeyFrameInfo(), QueryMarkup(), QueryMarkupMap(), QueryMplexID(), QueryPositionMap(), QueryRecordingGroup(), QueryTotalDuration(), QueryTotalFrames(), QueryTranscoderID(), QueryTranscodeStatus(), QueryTuningInfo(), RecordingInfo::RecordingInfo(), Reload(), SaveAspect(), SaveAutoExpire(), SaveBookmark(), SaveCommFlagged(), SaveCutList(), SaveDeletePendingFlag(), SaveEditing(), SaveFilesize(), SaveFrameRate(), SaveInetRef(), SaveMarkup(), SaveMarkupMap(), SavePositionMap(), SavePositionMapDelta(), SavePreserve(), SaveResolution(), SaveSeasonEpisode(), SaveTotalDuration(), SaveTotalFrames(), SaveTranscodeStatus(), SaveVideoProperties(), SaveWatched(), SetPathname(), RecordingInfo::StartedRecording(), SubstituteMatches(), ToMap(), ToStringList(), and RecordingInfo::UpdateRecordingEnd(). Definition at line 751 of file programinfo.h. Referenced by ChannelText(), clear(), clone(), FromStringList(), LoadProgramFromRecorded(), operator==(), ProgramInfo(), RecordingInfo::RecordingInfo(), ToMap(), ToStringList(), ProgramRecPriority::updateInfo(), and ProgramRecPriority::UpdateList(). Definition at line 752 of file programinfo.h. Referenced by RecordingInfo::AddHistory(), ChannelText(), clear(), clone(), RecordingInfo::DeleteHistory(), RecordingInfo::ForgetHistory(), FromStringList(), IsSameChannel(), LoadProgramFromRecorded(), operator==(), ProgramInfo(), RecordingInfo::ReactivateRecording(), RecordingInfo::RecordingInfo(), ToMap(), ToStringList(), ProgramRecPriority::updateInfo(), and ProgramRecPriority::UpdateList(). Definition at line 753 of file programinfo.h. Referenced by ChannelText(), clear(), clone(), FromStringList(), LoadProgramFromRecorded(), operator==(), ProgramInfo(), RecordingInfo::RecordingInfo(), ToMap(), toString(), ToStringList(), ProgramRecPriority::updateInfo(), and ProgramRecPriority::UpdateList(). Definition at line 754 of file programinfo.h. Referenced by clear(), clone(), FromStringList(), LoadProgramFromRecorded(), operator==(), ProgramInfo(), RecordingInfo::RecordingInfo(), ToMap(), and ToStringList(). Definition at line 756 of file programinfo.h. Referenced by RecordingInfo::ApplyRecordRecGroupChange(), clear(), clone(), FromStringList(), RecordingInfo::InsertProgram(), LoadProgramFromRecorded(), operator==(), QueryRecordingGroup(), SubstituteMatches(), ToMap(), and ToStringList(). Definition at line 757 of file programinfo.h. Referenced by RecordingInfo::ApplyRecordPlayGroupChange(), clear(), clone(), FromStringList(), RecordingInfo::InsertProgram(), LoadProgramFromRecorded(), operator==(), SubstituteMatches(), ToMap(), and ToStringList(). Definition at line 759 of file programinfo.h. Referenced by clear(), ClearMarkupMap(), ClearPositionMap(), clone(), DiscoverProgramInfoType(), DiscoverRecordingDirectory(), FromStringList(), RecordingInfo::InsertProgram(), IsFileReadable(), LoadProgramFromRecorded(), MarkAsInUse(), operator==(), QueryKeyFrameInfo(), QueryMarkup(), QueryMarkupMap(), QueryPositionMap(), SaveMarkup(), SaveMarkupMap(), SavePositionMap(), SavePositionMapDelta(), SaveWatched(), SetPathname(), RecordingInfo::StartedRecording(), and ToStringList(). Definition at line 761 of file programinfo.h. Referenced by clear(), clone(), DiscoverRecordingDirectory(), FromStringList(), GetPlaybackURL(), RecordingInfo::InsertProgram(), LoadProgramFromRecorded(), MarkAsInUse(), operator==(), ProgramInfo(), RecordingInfo::RecordingInfo(), RecordingInfo::StartedRecording(), SubstituteMatches(), and ToStringList(). Definition at line 762 of file programinfo.h. Referenced by RecordingInfo::ApplyStorageGroupChange(), clear(), clone(), FromStringList(), GetPlaybackURL(), RecordingInfo::InsertProgram(), LoadProgramFromRecorded(), operator==(), RecordingInfo::RecordingInfo(), ToMap(), and ToStringList(). Definition at line 764 of file programinfo.h. Referenced by RecordingInfo::AddHistory(), clear(), clone(), FromStringList(), RecordingInfo::InsertProgram(), LoadProgramFromRecorded(), operator==(), ToMap(), and ToStringList(). Definition at line 765 of file programinfo.h. Referenced by RecordingInfo::AddHistory(), clear(), clone(), RecordingInfo::ForgetHistory(), FromStringList(), RecordingInfo::InsertProgram(), IsDuplicateProgram(), IsGeneric(), IsSameProgram(), LoadProgramFromRecorded(), operator==(), ProgramInfo(), RecordingInfo::SetDupHistory(), ToMap(), and ToStringList(). Definition at line 766 of file programinfo.h. Definition at line 767 of file programinfo.h. Referenced by clear(), clone(), FromStringList(), GetCategoryTypeString(), IsDuplicateProgram(), IsGeneric(), IsSameProgram(), LoadProgramFromRecorded(), operator==(), RecordingInfo::RecordingInfo(), ToMap(), and ToStringList(). Definition at line 769 of file programinfo.h. Referenced by clear(), clone(), FromStringList(), GetFilesize(), LoadProgramFromRecorded(), operator==(), SetFilesize(), ToMap(), and ToStringList(). Definition at line 771 of file programinfo.h. Referenced by RecordingInfo::AddHistory(), clear(), RecordingInfo::clone(), clone(), RecordingInfo::ForgetHistory(), FromStringList(), GetSecondsInRecording(), RecordingInfo::InsertProgram(), IsSameProgramAndStartTime(), IsSameProgramWeakCheck(), IsSameTitleStartTimeAndChannel(), IsSameTitleTimeslotAndChannel(), LoadProgramFromRecorded(), operator==(), ProgramInfo(), QueryCategoryType(), RecordingInfo::ReactivateRecording(), RecordingInfo::RecordingInfo(), SaveVideoProperties(), RecordingInfo::StartedRecording(), SubstituteMatches(), ToMap(), toString(), and ToStringList(). Definition at line 772 of file programinfo.h. Referenced by RecordingInfo::AddHistory(), clear(), clone(), FromStringList(), GetSecondsInRecording(), RecordingInfo::InsertProgram(), IsSameTitleTimeslotAndChannel(), LoadProgramFromRecorded(), operator==(), ProgramInfo(), RecordingInfo::RecordingInfo(), SubstituteMatches(), ToMap(), toString(), and ToStringList(). Definition at line 773 of file programinfo.h. Referenced by RecordingInfo::ApplyRecordPlayGroupChange(), RecordingInfo::ApplyRecordRecGroupChange(), RecordingInfo::ApplyRecordRecID(), RecordingInfo::ApplyRecordRecTitleChange(), RecordingInfo::ApplyStorageGroupChange(), RecordingInfo::ApplyTranscoderProfileChange(), RecordingInfo::ApplyTranscoderProfileChangeById(), clear(), ClearMarkupMap(), ClearPositionMap(), RecordingInfo::clone(), clone(), CreateRecordBasename(), RecordingInfo::DeleteHistory(), RecordingInfo::FinishedRecording(), RecordingInfo::ForgetHistory(), FromStringList(), GetFilesize(), GetSecondsInRecording(), RecordingInfo::InsertProgram(), IsSameRecording(), LoadProgramFromRecorded(), MarkAsInUse(), operator==(), ProgramInfo(), QueryAutoExpire(), QueryAverageAspectRatio(), QueryAverageFrameRate(), QueryAverageHeight(), QueryAverageWidth(), QueryBookmarkTimeStamp(), QueryIsEditing(), QueryIsInUse(), QueryKeyFrameInfo(), QueryMarkup(), QueryMarkupMap(), QueryPositionMap(), QueryRecordingGroup(), QueryTotalDuration(), QueryTotalFrames(), QueryTranscoderID(), QueryTranscodeStatus(), RecordingInfo::RecordingInfo(), Reload(), SaveAspect(), SaveAutoExpire(), SaveBookmark(), SaveCommFlagged(), SaveCutList(), SaveDeletePendingFlag(), SaveEditing(), SaveFilesize(), SaveFrameRate(), SaveInetRef(), SaveMarkup(), SaveMarkupMap(), SavePositionMap(), SavePositionMapDelta(), SavePreserve(), SaveResolution(), SaveSeasonEpisode(), SaveTotalDuration(), SaveTotalFrames(), SaveTranscodeStatus(), SaveWatched(), RecordingInfo::StartedRecording(), SubstituteMatches(), ToMap(), toString(), ToStringList(), UpdateLastDelete(), and RecordingInfo::UpdateRecordingEnd(). Definition at line 774 of file programinfo.h. Referenced by clear(), clone(), RecordingInfo::FinishedRecording(), FromStringList(), RecordingInfo::InsertProgram(), LoadProgramFromRecorded(), operator==(), ProgramInfo(), RecordingInfo::RecordingInfo(), SubstituteMatches(), ToMap(), toString(), ToStringList(), and RecordingInfo::UpdateRecordingEnd(). Definition at line 776 of file programinfo.h. Referenced by clear(), clone(), FromStringList(), RecordingInfo::InsertProgram(), LoadProgramFromRecorded(), operator==(), RecordingInfo::RecordingInfo(), ToMap(), and ToStringList(). Definition at line 777 of file programinfo.h. Referenced by clear(), clone(), FromStringList(), RecordingInfo::InsertProgram(), LoadProgramFromRecorded(), operator==(), ProgramInfo(), RecordingInfo::RecordingInfo(), SubstituteMatches(), ToMap(), and ToStringList(). Definition at line 778 of file programinfo.h. Referenced by clear(), clone(), FromStringList(), LoadProgramFromRecorded(), operator==(), RecordingInfo::RecordingInfo(), ToMap(), and ToStringList(). Definition at line 779 of file programinfo.h. Referenced by clear(), clone(), LoadProgramFromRecorded(), MarkAsInUse(), operator==(), and UpdateInUseMark(). Definition at line 781 of file programinfo.h. Referenced by clear(), clone(), FromStringList(), LoadProgramFromRecorded(), operator==(), ToMap(), and ToStringList(). Definition at line 783 of file programinfo.h. Referenced by RecordingInfo::AddHistory(), clear(), clone(), RecordingInfo::DeleteHistory(), RecordingInfo::ForgetHistory(), FromStringList(), RecordingInfo::getRecordID(), RecordingInfo::InsertProgram(), IsDuplicateProgram(), LoadProgramFromRecorded(), operator==(), ProgramInfo(), RecordingInfo::RecordingInfo(), SaveInetRef(), SaveSeasonEpisode(), ToStringList(), and UpdateLastDelete(). Definition at line 784 of file programinfo.h. Referenced by RecordingInfo::AddHistory(), RecordingInfo::ApplyRecordRecID(), clear(), clone(), RecordingInfo::DeleteHistory(), RecordingInfo::ForgetHistory(), FromStringList(), RecordingInfo::InsertProgram(), IsDuplicateProgram(), LoadProgramFromRecorded(), operator==(), RecordingInfo::RecordingInfo(), RecordingInfo::SubstituteMatches(), and ToStringList(). Definition at line 786 of file programinfo.h. Referenced by clear(), clone(), FromStringList(), LoadProgramFromRecorded(), operator==(), QueryTuningInfo(), RecordingInfo::RecordingInfo(), and ToStringList(). Definition at line 787 of file programinfo.h. Referenced by clear(), clone(), FromStringList(), LoadProgramFromRecorded(), operator==(), ProgramInfo(), QueryTuningInfo(), RecordingInfo::RecordingInfo(), ToMap(), and ToStringList(). Definition at line 788 of file programinfo.h. Referenced by RecordingInfo::AddHistory(), clear(), clone(), RecordingInfo::DeleteHistory(), RecordingInfo::ForgetHistory(), FromStringList(), RecordingInfo::InsertProgram(), IsDuplicateProgram(), LoadProgramFromRecorded(), operator==(), ProgramInfo(), RecordingInfo::RecordingInfo(), RecordingInfo::SetDupHistory(), RecordingInfo::SubstituteMatches(), and ToStringList(). Definition at line 790 of file programinfo.h. Referenced by clear(), clone(), FromStringList(), LoadProgramFromRecorded(), MarkAsInUse(), operator==(), ProgramInfo(), QueryBDBookmark(), QueryBookmark(), QueryDVDBookmark(), QueryIsEditing(), QueryLastPlayPos(), QueryProgStart(), RecordingInfo::RecordingInfo(), SaveAutoExpire(), SaveBookmark(), SaveCommFlagged(), SaveDeletePendingFlag(), SaveEditing(), SavePreserve(), SaveTranscodeStatus(), SaveWatched(), ToMap(), and ToStringList(). Definition at line 792 of file programinfo.h. Referenced by clear(), clone(), FromStringList(), LoadProgramFromRecorded(), operator==(), RecordingInfo::RecordingInfo(), and SaveVideoProperties(). Definition at line 793 of file programinfo.h. Referenced by clear(), clone(), FromStringList(), RecordingInfo::InsertProgram(), LoadProgramFromRecorded(), operator==(), ProgramInfo(), RecordingInfo::RecordingInfo(), ToMap(), and ToStringList(). Definition at line 794 of file programinfo.h. Definition at line 795 of file programinfo.h. Definition at line 797 of file programinfo.h. Referenced by clear(), clone(), ProgramRecPriority::deactivate(), ProgramRecPriority::FillList(), RecordingInfo::FinishedRecording(), FromStringList(), LoadProgramFromRecorded(), operator==(), ProgramInfo(), RecordingInfo::RecordingInfo(), ProgramRecPriority::scheduleChanged(), RecordingInfo::SubstituteMatches(), ToMap(), ToStringList(), and ProgramRecPriority::UpdateList(). Definition at line 798 of file programinfo.h. Referenced by RecordingInfo::AddHistory(), RecordingInfo::ApplyRecordRecID(), clear(), clone(), FromStringList(), RecordingInfo::InsertProgram(), LoadProgramFromRecorded(), operator==(), ProgramInfo(), RecordingInfo::RecordingInfo(), RecordingInfo::SubstituteMatches(), ToStringList(), ProgramRecPriority::updateInfo(), and ProgramRecPriority::UpdateList(). Definition at line 799 of file programinfo.h. Referenced by clear(), clone(), RecordingInfo::ForgetHistory(), FromStringList(), LoadProgramFromRecorded(), operator==(), ProgramInfo(), RecordingInfo::RecordingInfo(), and ToStringList(). Definition at line 800 of file programinfo.h. Referenced by clear(), clone(), RecordingInfo::ForgetHistory(), FromStringList(), IsDuplicateProgram(), IsSameProgram(), LoadProgramFromRecorded(), operator==(), ProgramInfo(), RecordingInfo::RecordingInfo(), and ToStringList(). Definition at line 802 of file programinfo.h. Referenced by clear(), clone(), FromStringList(), LoadProgramFromRecorded(), RecordingInfo::LoadRecordingFile(), operator==(), ProgramInfo(), QueryBasename(), SaveBasename(), RecordingInfo::SaveFilesize(), SaveFilesize(), SendAddedEvent(), SendDeletedEvent(), SendUpdateEvent(), RecordingInfo::SetFilesize(), SubstituteMatches(), ToMap(), and ToStringList(). Definition at line 803 of file programinfo.h. Referenced by clear(), clone(), FromStringList(), LoadProgramFromRecorded(), operator==(), ProgramInfo(), ToMap(), and ToStringList(). Definition at line 804 of file programinfo.h. Referenced by clear(), clone(), FromStringList(), LoadProgramFromRecorded(), operator==(), and ToStringList(). Definition at line 807 of file programinfo.h. Referenced by clear(), clone(), FromStringList(), LoadProgramFromRecorded(), and SetAvailableStatus(). Definition at line 812 of file programinfo.h. Referenced by clear(), clone(), GuideGrid::cursorRight(), GuideUpdateProgramRow::fillProgramRowInfosWith(), FromStringList(), and LoadProgramFromRecorded(). Definition at line 813 of file programinfo.h. Referenced by clear(), clone(), GuideGrid::cursorLeft(), GuideGrid::cursorRight(), GuideUpdateProgramRow::fillProgramRowInfosWith(), FromStringList(), and LoadProgramFromRecorded(). "SELECT r.title, r.subtitle, r.description, "
" r.season, r.episode, r.category, "
" r.chanid, c.channum, c.callsign, "
" r.playgroup, r.storagegroup, r.basename, "
" r.hostname, r.recpriority, r.seriesid, "
" r.programid, r.inetref, r.filesize, "
" r.progstart, r.progend, r.stars, "
" r.starttime, r.endtime, p.airdate+0, "
" r.originalairdate, r.lastmodified, r.recordid, "
" c.commmethod, r.commflagged, r.previouslyshown, "
" r.transcoder, r.transcoded, r.deletepending, "
" r.preserve, r.cutlist, r.autoexpire, "
" r.editing, r.bookmark, r.watched, "
" p.audioprop+0, p.videoprop+0, p.subtitletypes+0, "
" r.findid, rec.dupin, rec.dupmethod, "
" p.syndicatedepisodenumber, p.partnumber, p.parttotal, "
" p.season, p.episode, p.totalepisodes, "
" p.category_type, r.recordedid, r.inputname, "
"FROM recorded AS r "
"LEFT JOIN channel AS c "
"ON (r.chanid = c.chanid) "
"LEFT JOIN recordedprogram AS p "
"ON (r.chanid = p.chanid AND "
" r.progstart = p.starttime) "
"LEFT JOIN record AS rec "
"ON (r.recordid = rec.recordid) "
Definition at line 815 of file programinfo.h. Referenced by LoadFromRecorded(), and LoadProgramFromRecorded(). Definition at line 818 of file programinfo.h. Referenced by clear(), clone(), FromStringList(), LoadProgramFromRecorded(), MarkAsInUse(), and UpdateInUseMark(). Definition at line 819 of file programinfo.h. Referenced by clear(), ClearPositionMap(), clone(), FromStringList(), LoadProgramFromRecorded(), QueryPositionMap(), SavePositionMap(), and SavePositionMapDelta(). Definition at line 821 of file programinfo.h. Referenced by InitStatics(), and RecordingInfo::RecordingInfo(). Definition at line 822 of file programinfo.h. Referenced by InitStatics(), RecordingInfo::SaveFilesize(), SaveFilesize(), SendAddedEvent(), SendDeletedEvent(), SendUpdateEvent(), and RecordingInfo::SetFilesize(). Definition at line 823 of file programinfo.h. Referenced by CheckProgramIDAuthorities(), IsDuplicateProgram(), and IsSameProgram().